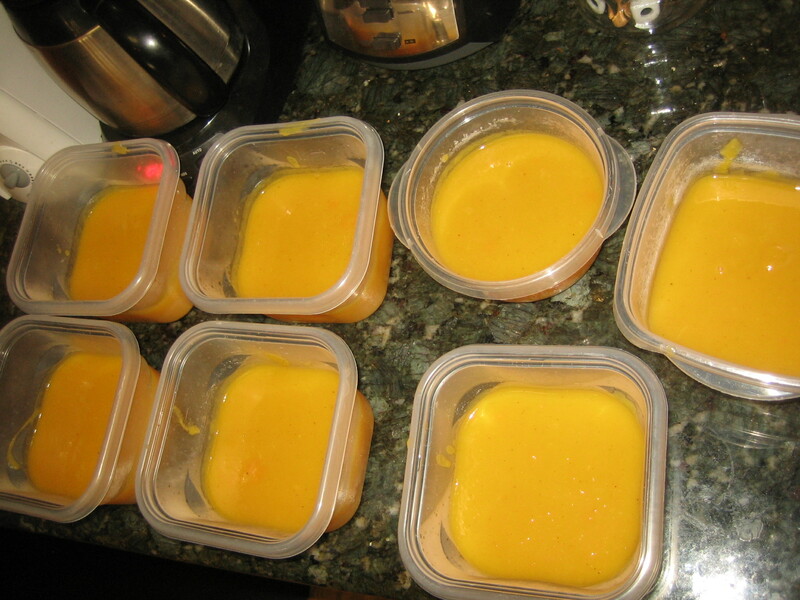 Nearly every Sunday I make a soup that phil and I can pull out of the fridge for lunches. I usually get about 6 servings – so its a good three days of lunch for the both of us. 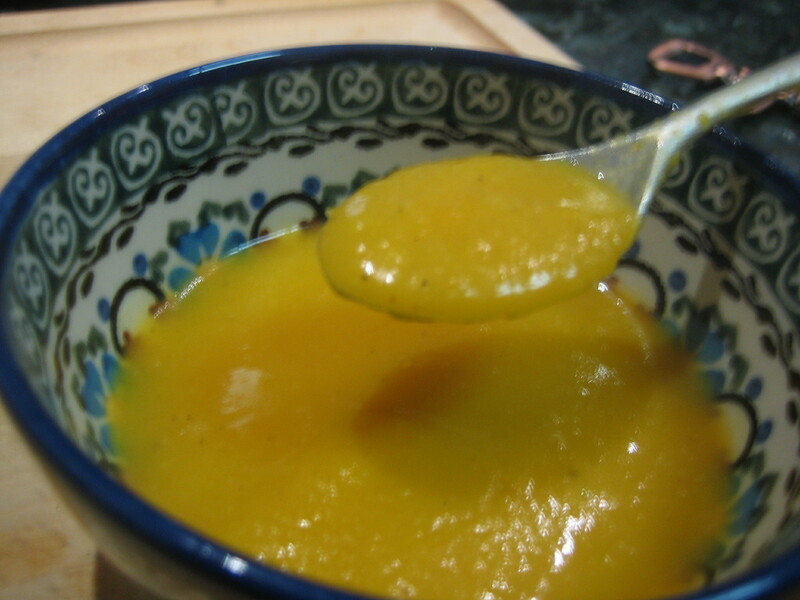 This curry butternut squash soup makes an appearance every few weeks. 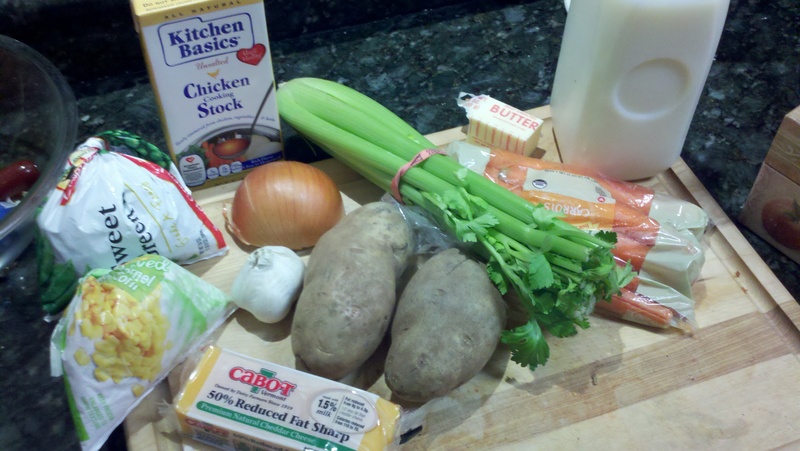 I love to make this soup. Everything I put in it is so wholesome. The ingredients arent altered in any way what-so-ever. I tell phil that I want to make this soup in a cauldron over a fire someday. ‘Oregon Trail’ style. Meals like this remind me that food comes from the earth. Not a package. And it makes me feel good. 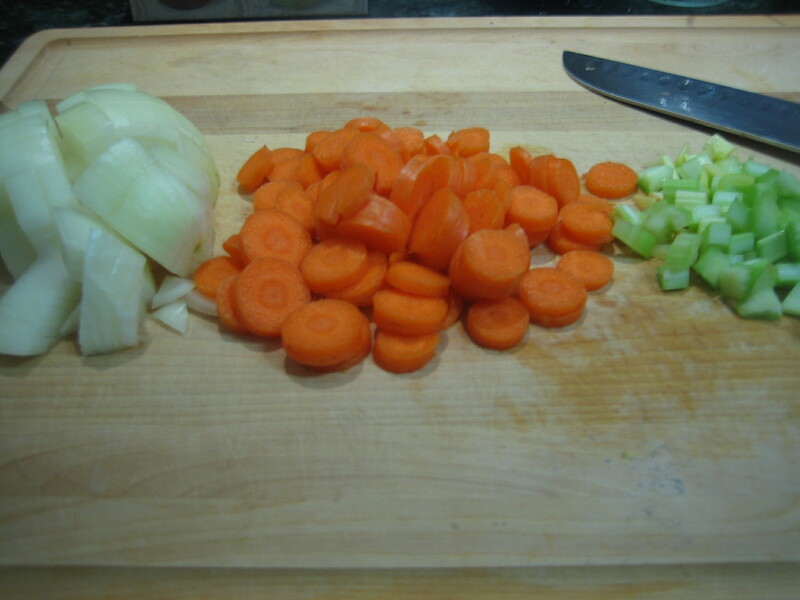 This was 1.5 – 1.75 cup of onion, 1.25 cup of carrot (didnt even peel them), and .5 cup celery. 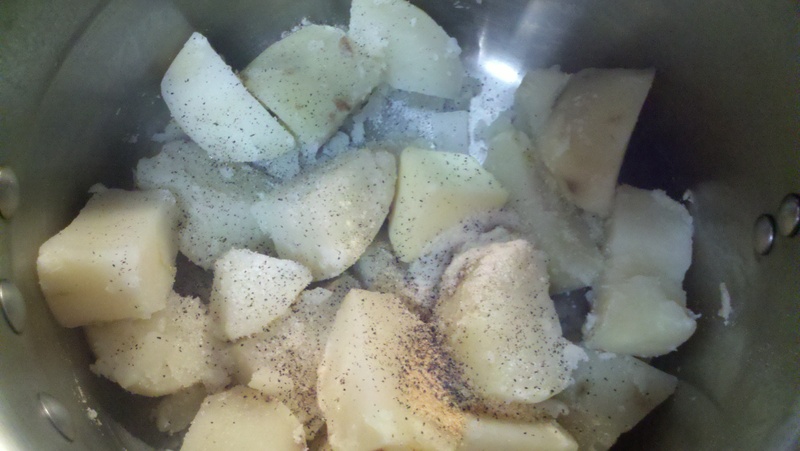 Let those all saute for 5-7 minutes together with a bit of salt and pepper until soft. Then throw in some garlic. This was about 5 small cloves, or 2 tablespoons. And I loooove that I can rough chop this. Mincing garlic is a necessary evil in my book. I dont like to buy extra gadgets (i.e. garlic press) or buy the pre-minced garlic, but I will still complain all night long about how sticky the garlic is and how I hate to chop it. So throw in the garlic and peel up your potatoes. Do a rough chop on these and thrown them in the pot as well. I used about 1.25 cup of white potato and 1.5 cup of sweet potato. You could add a touch more salt and pepper to flavor these guys up, too. 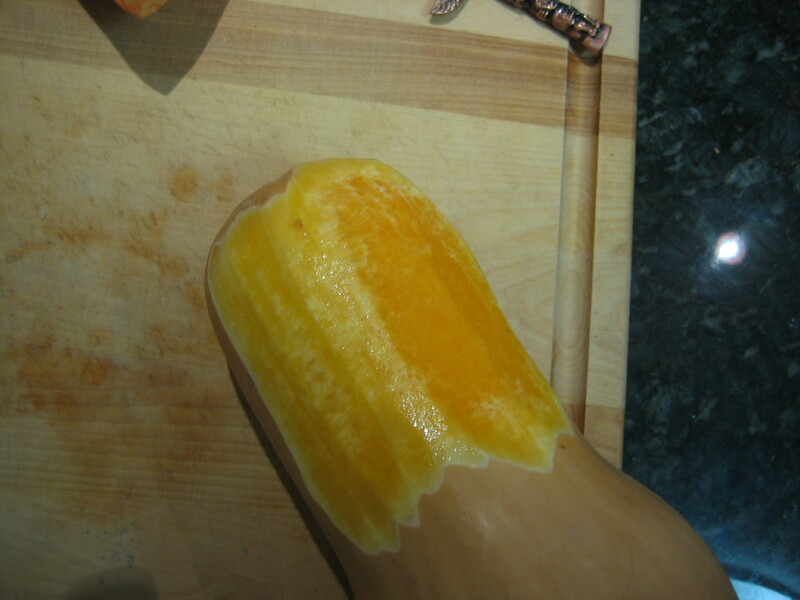 In the far right picture, notice there are varying degrees of peeling the butternut squash, you’ll want to go all the way down to the thicker orange part, getting off as much white as you can. (twss). 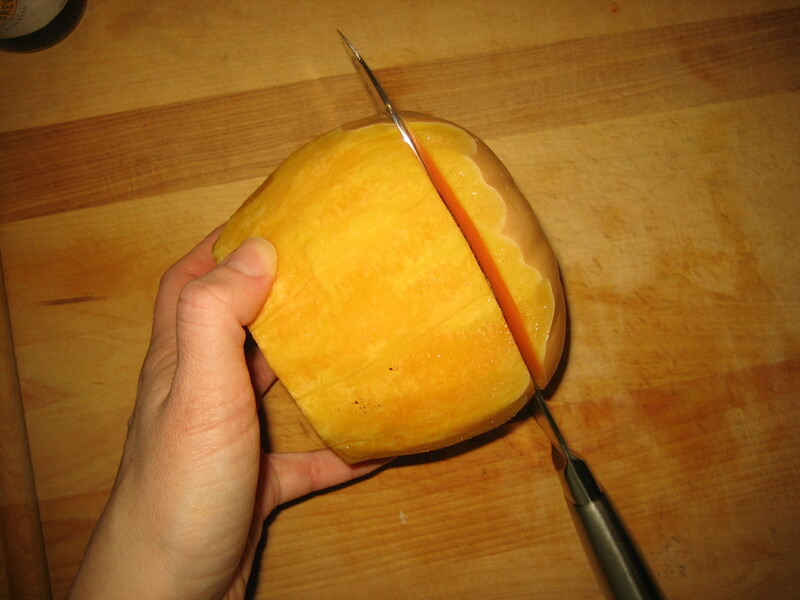 It is awkward to peel the rounded part. 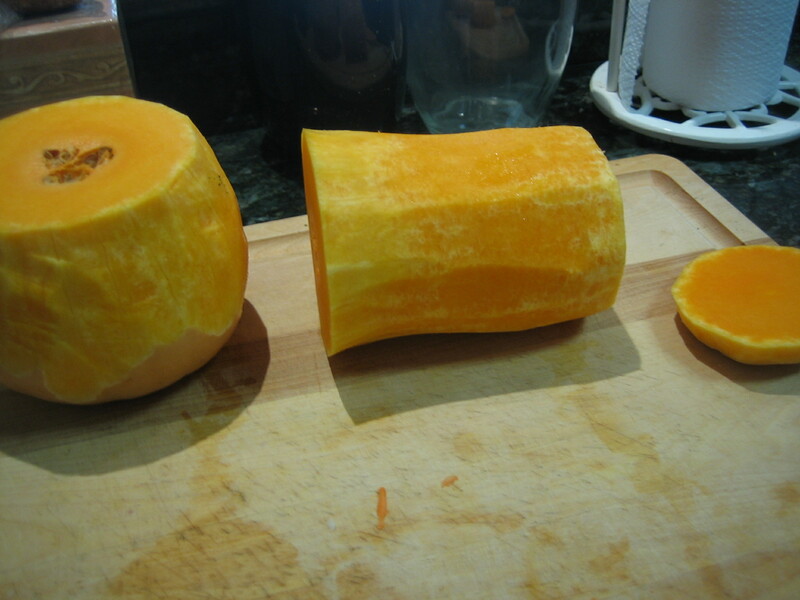 If you’re dealing with a big butternut squash, sometimes I just peel the long part and then use a knife to cut off the peel of the rounded part. 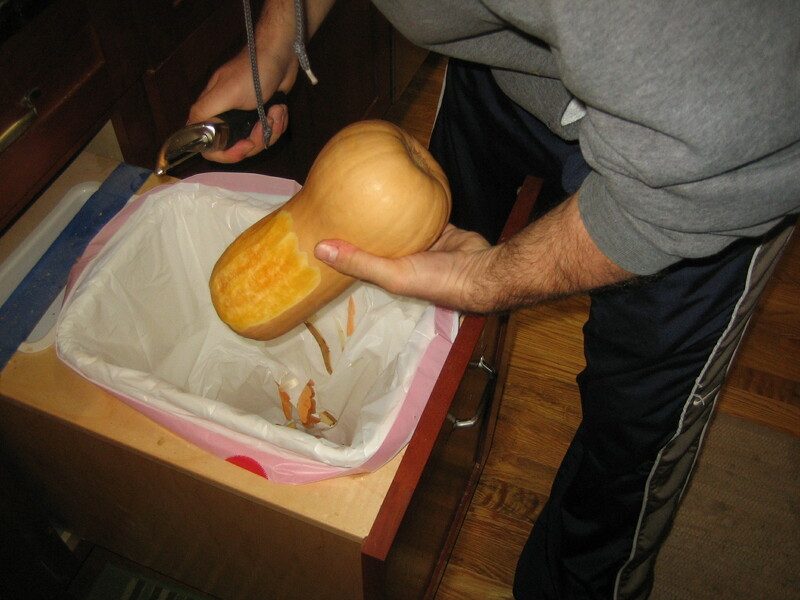 But since phil was helping, he peeled up the whole thing for me. So here is your final peeled product. 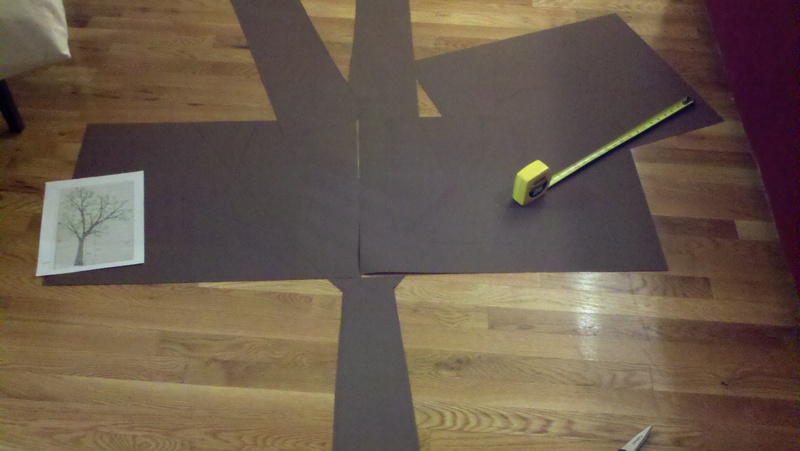 First you can cut out the long part and rough chop it. 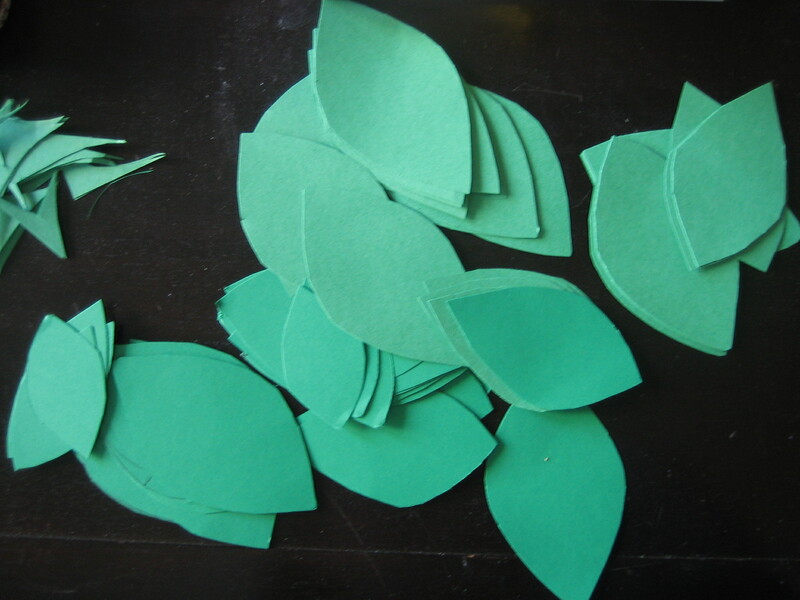 The lower rounded part has seeds you will have to deal with. 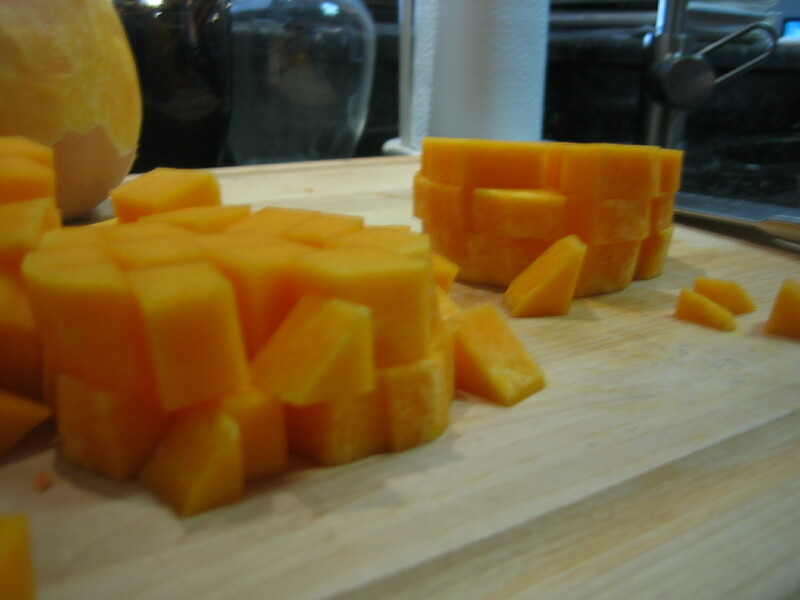 So chop off the end, trim up any parts that still might have peel on them and cut in half. 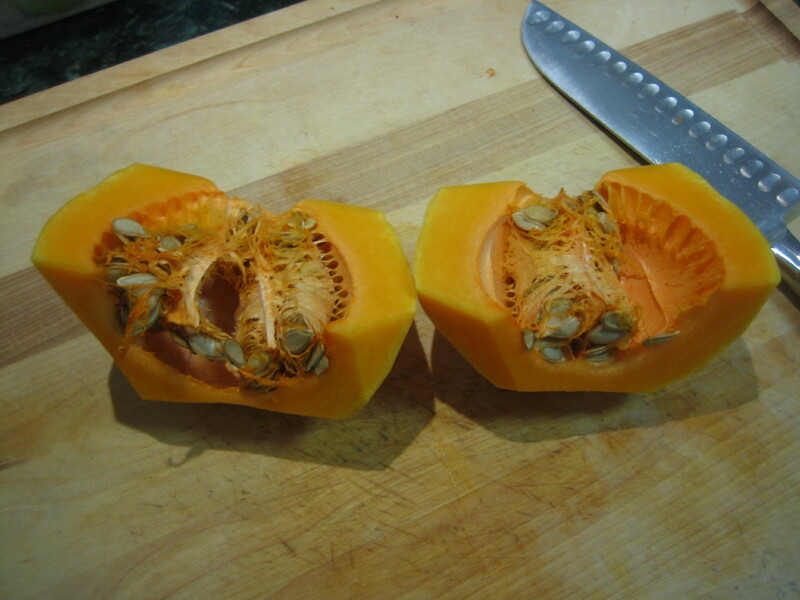 Then scoop out the seeds just like you are seeding a pumpkin. 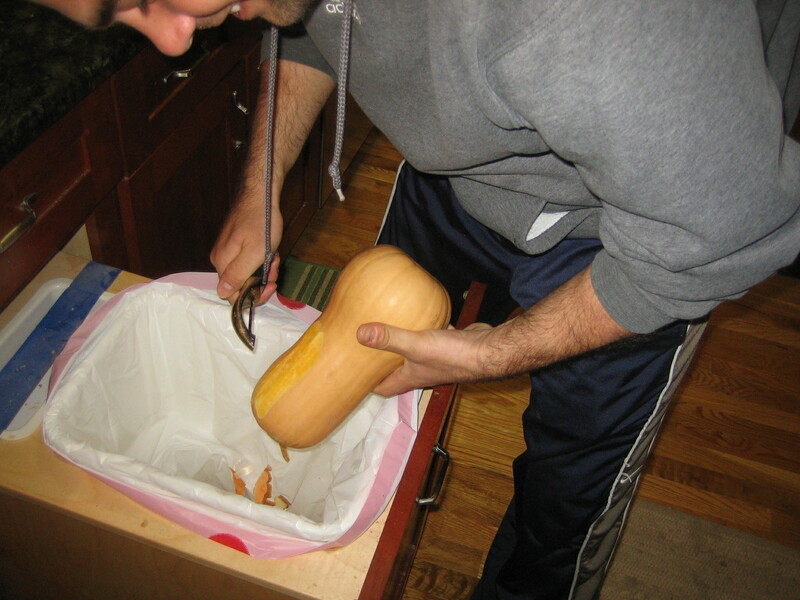 Then chop up the last bit and throw all your butternut squash into the pot. 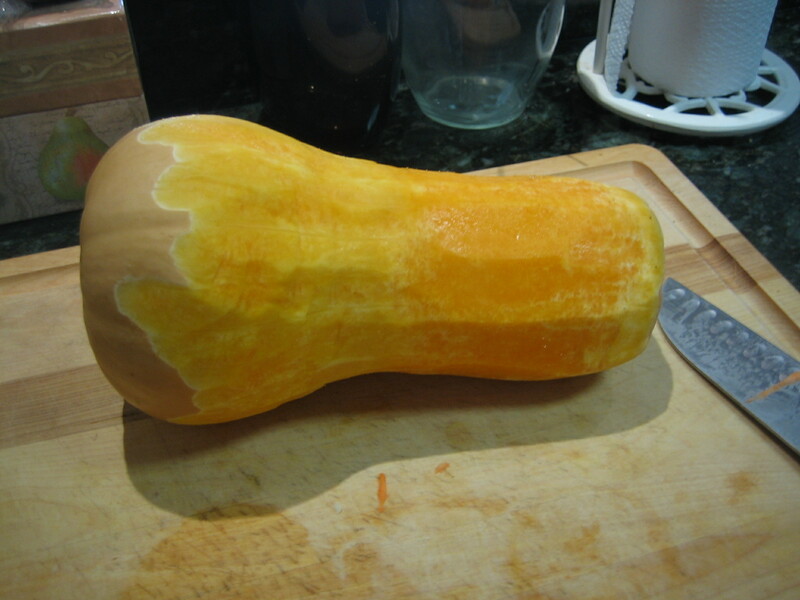 This particular butternut squash yielded about 6 cups of chopped squash. About 4 cups from the long part and 2 cups from the seeded round part. 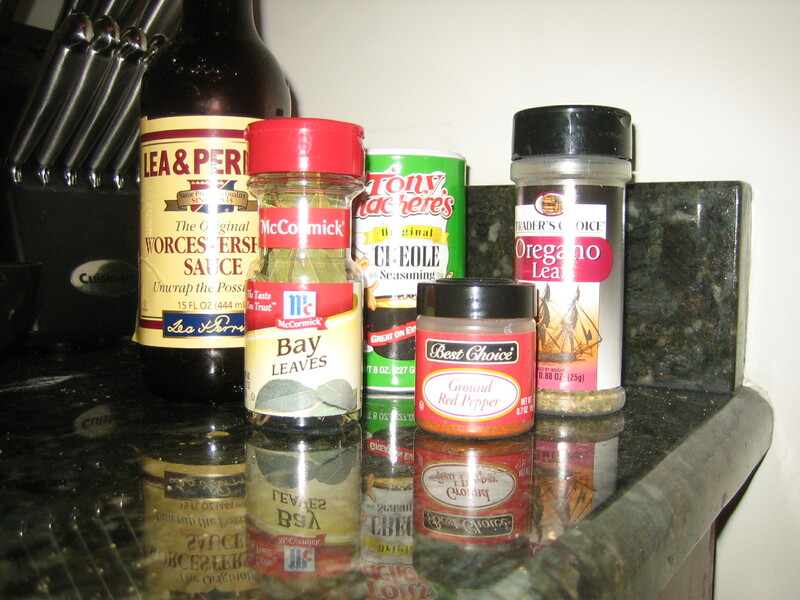 Now add your extra spices. About 1 teaspoon of curry powder and 1/8 teaspoon of cayenne. And then add your stock. I use just enough to cover all the vegetables. 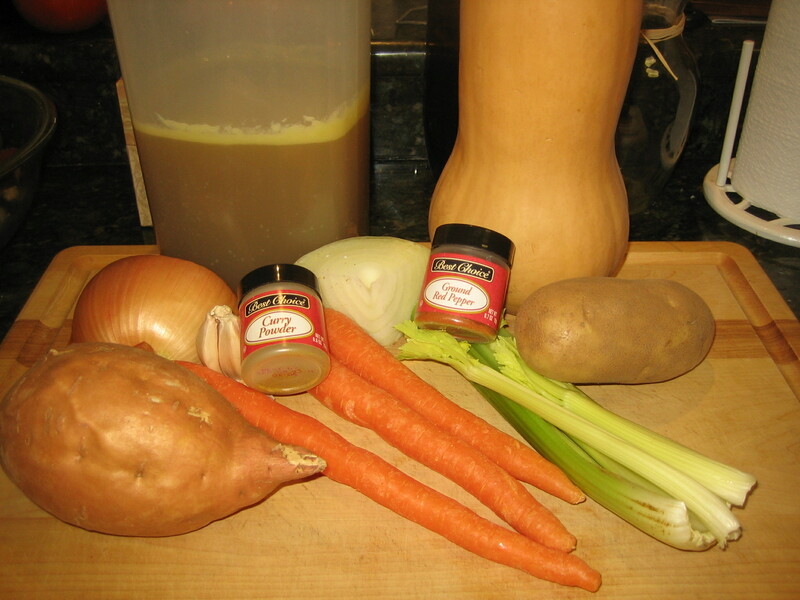 Once we blend the soup – it will make a very smooth soup. But feel free to add more or less depending on the thickness you like. I used 5 cups of chicken stock. Bring everything to a boil. Then cover it and knock it back to a simmer. 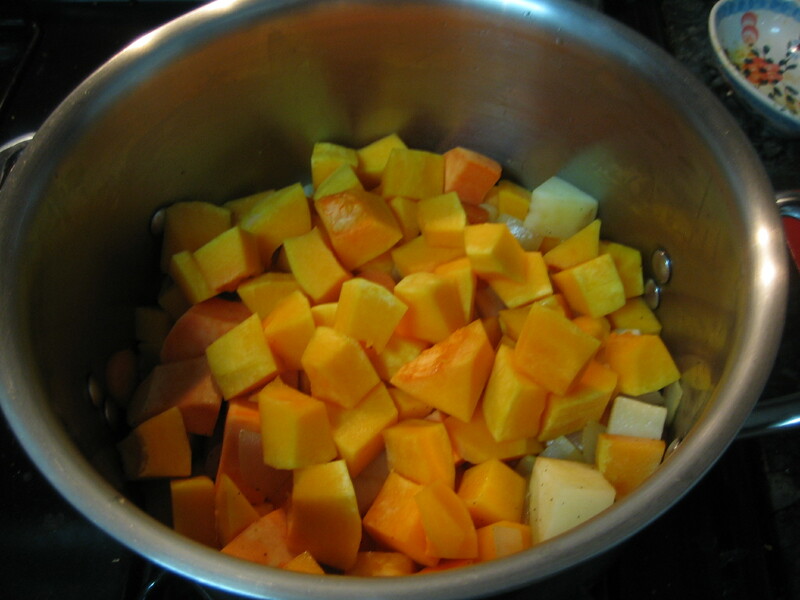 Simmer all together for 20 – 30 minutes until the squash and potatoes are soft enough to blend. 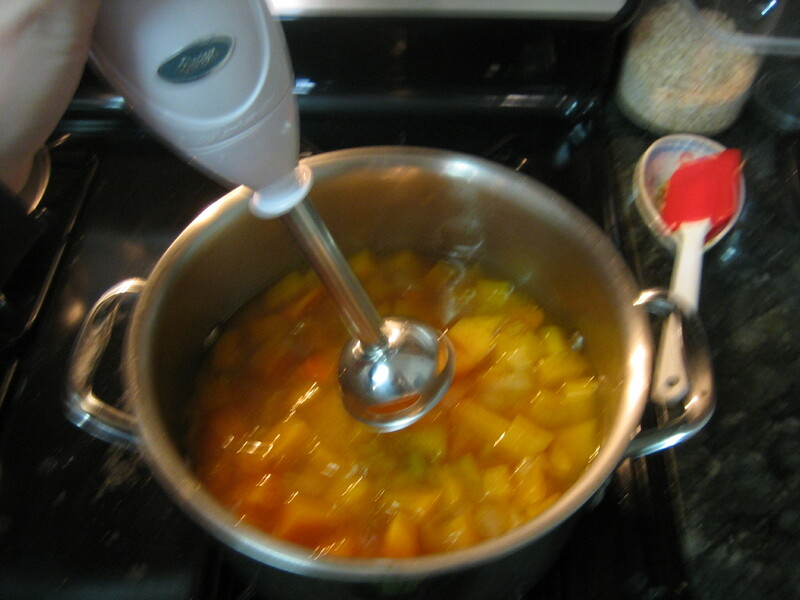 Then I break out my immersion blender. I dont think they had these on the Oregon Trail, but its a magical invention that allows you to blend the soup in the pot. 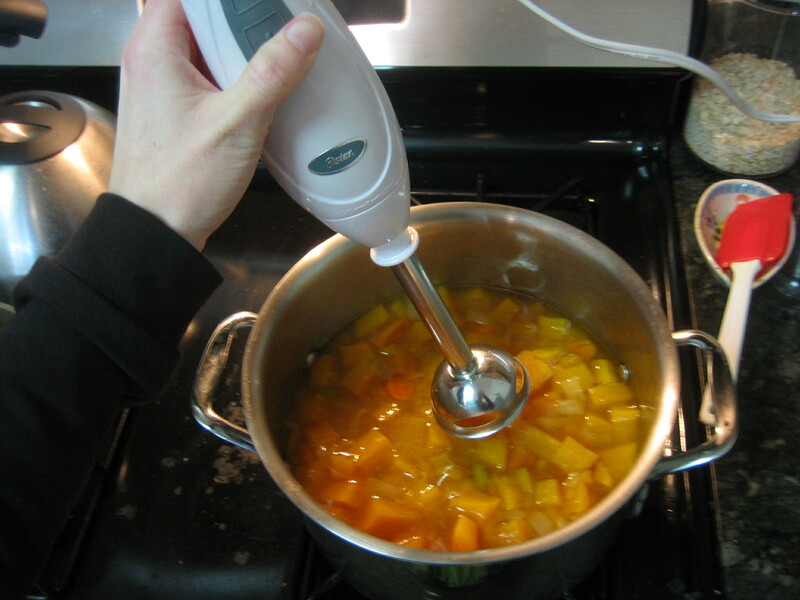 If you do not have one of these, you could ladle the soup into a blender or food processor. Or just have your soup in a more ‘rustic’ style and eat as is. This is now an excellent time to re-taste and make sure it has enough salt, spice, and curry to your liking. Add more salt, pepper, curry, cayenne as you please. We enjoyed a small bowl as soon as it was ready. But then got 7 decent sized lunch portions! At least there is something to look forward to on Monday! 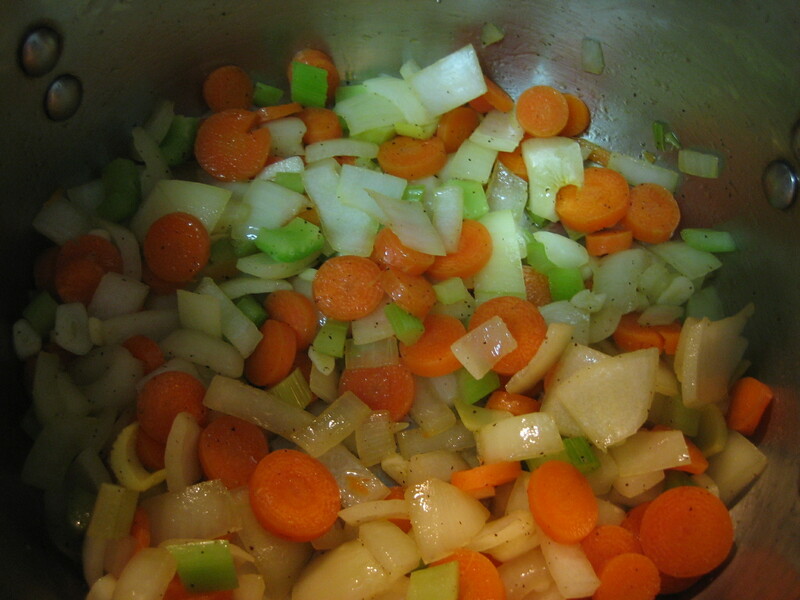 Chop onion, carrot, celery and saute in large stock pan with salt and pepper to taste, about 5-6 mins. 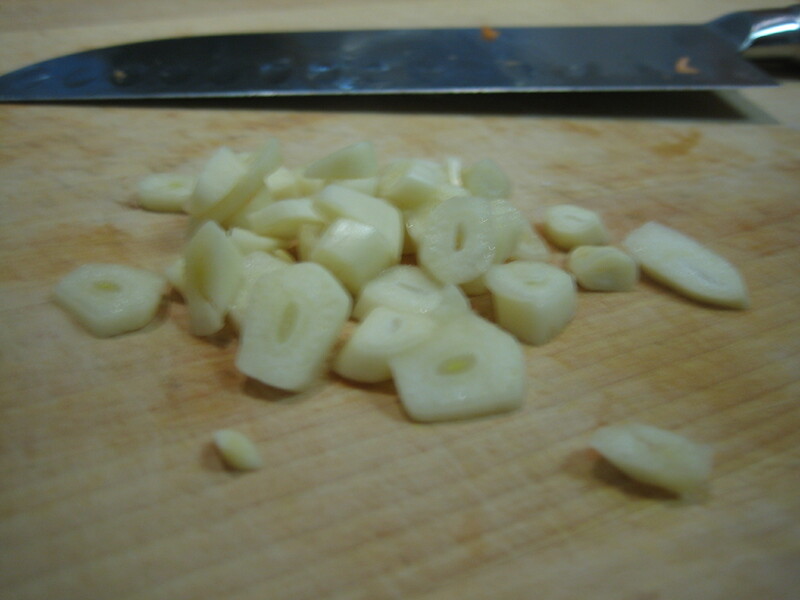 Peel and dice garlic, add to pot. 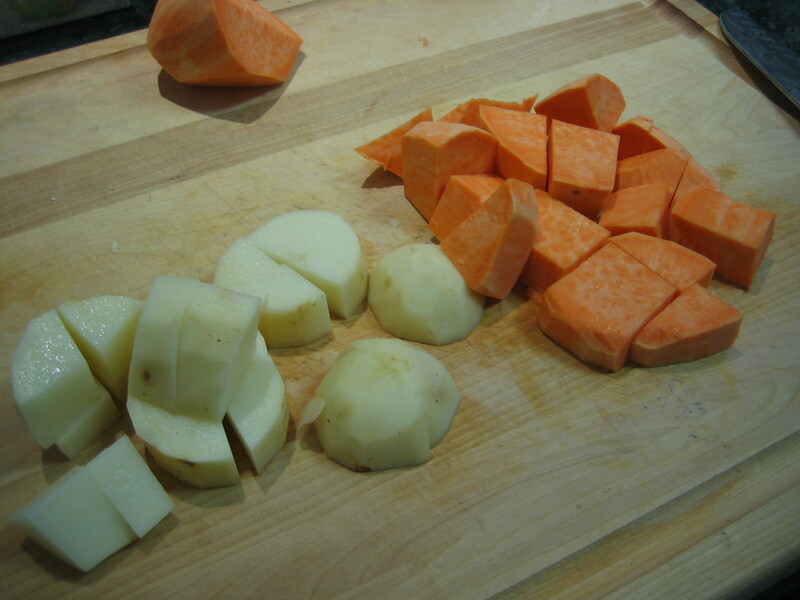 Peel and chop white potato, sweet potato, and butternut squash, add to pot. Add curry powder and cayenne. Add chicken stock. 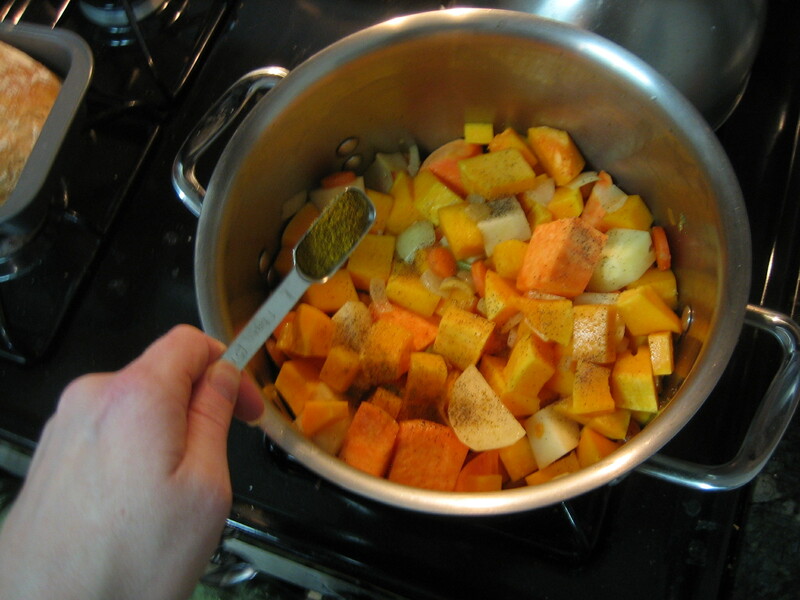 Bring to boil, then cover and reduce to simmer for 30 minutes or until potatoes and squash are soft. 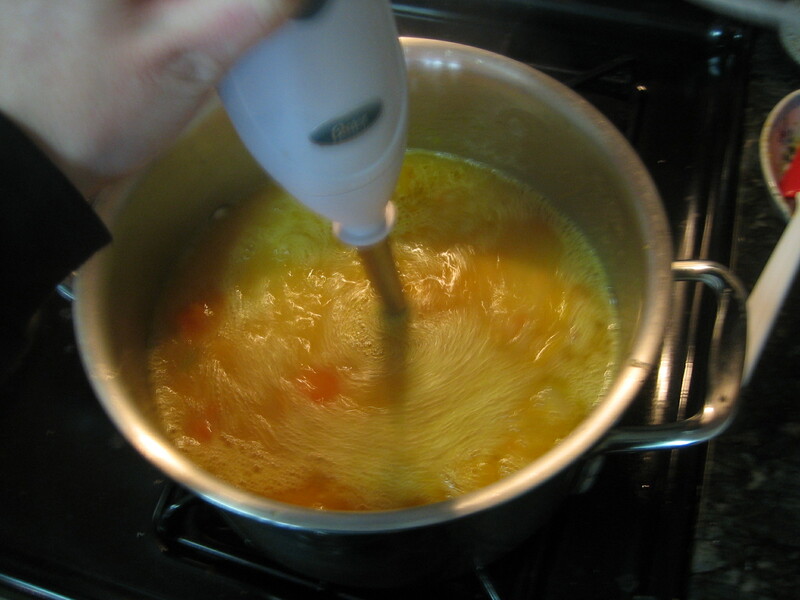 Blend soup with immersion blender, food processor, or blender. 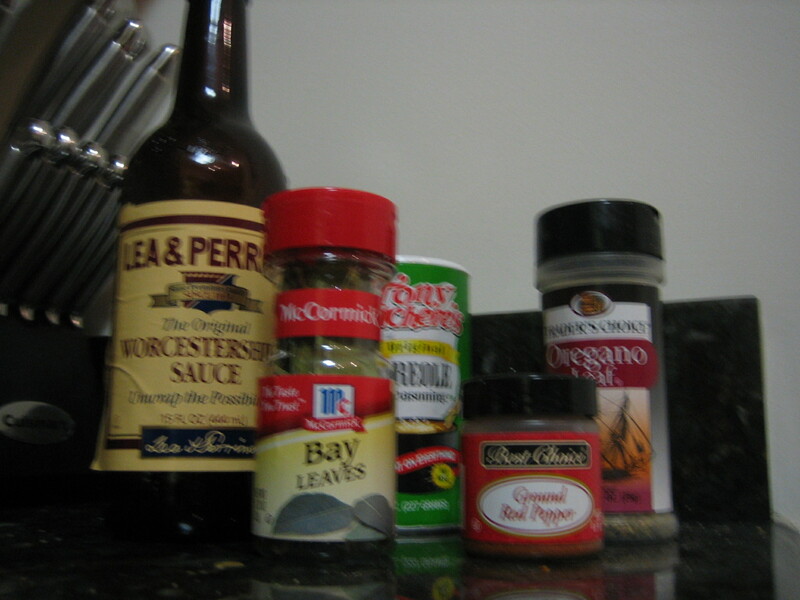 Taste for additional seasonings. Serves ~7 bowls. This meal is legit. 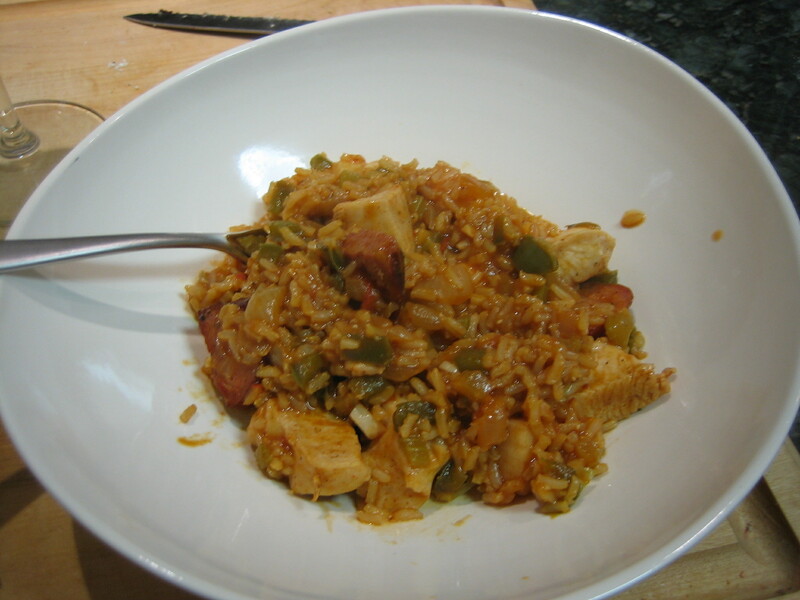 The shepards pie and lasagna have been loose adaptations, but not this jumbalaya. Probably because I took all my cues from Emeril’s Recipe. This is phil’s current favorite meal, so I figured I better figure out what Im actually doing so we can continue to enjoy it for years to come. As an aside, writing out these recipes has been so much fun for me. It takes a lot longer to make a meal since I have all the measuring cups out and Im taking pictures along the way, but Im also constantly surprising myself: ‘I put a whole CUP of onions in this thing?’. 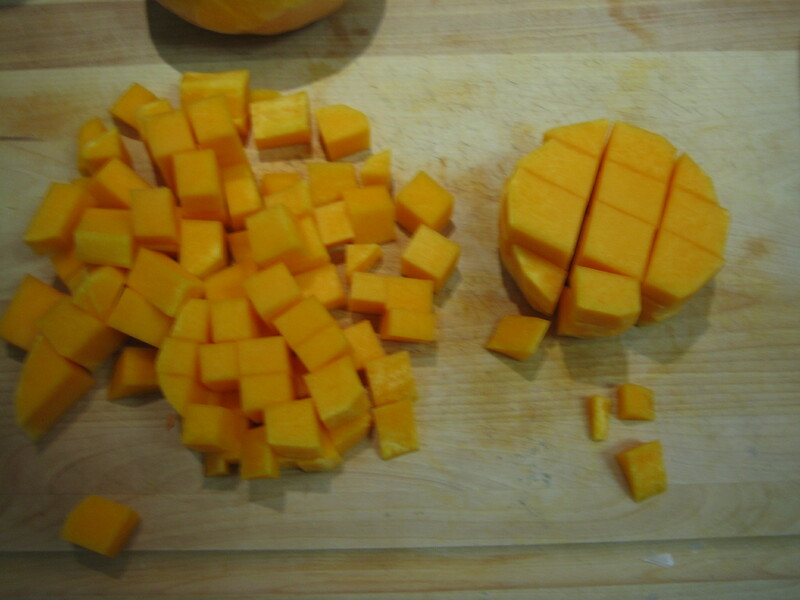 Ive always eye-balled things, so once I actually chop things up and measure them out, its never what I would have thought in my head. Hence why this little project is so important! Ew. Raw meat. 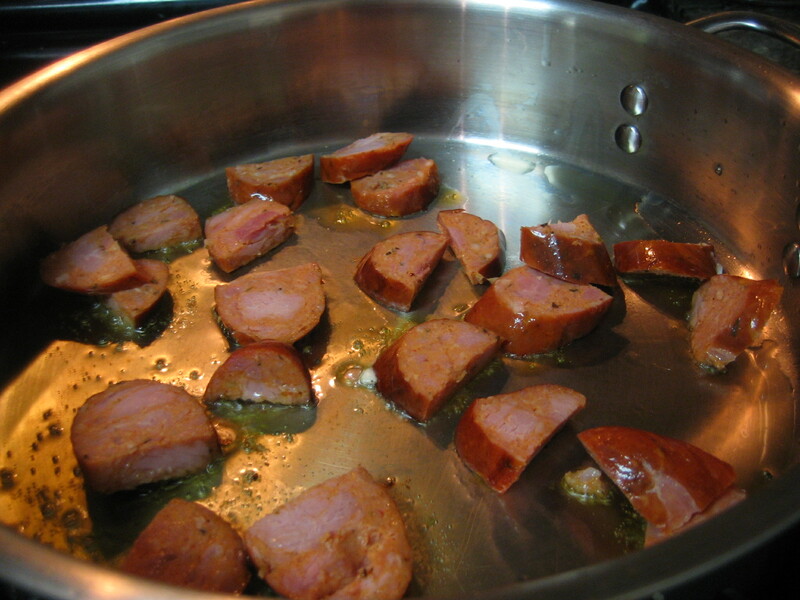 So after the andouille is browned up – remove the pieces with tongs and set aside on a plate. Then brown the chicken on all sides and remove to the plate. Dont worry about the chicken being cooked all the way through, it will finish cooking later. Just get some nice color (maybe a minute or 2 each side, tops) and then remove. 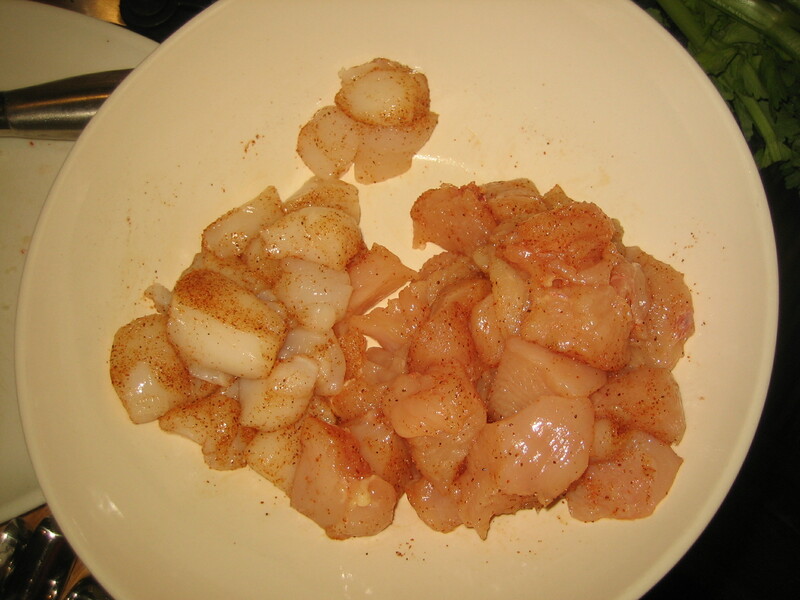 Then add your scallops. Now, these cook so fast and will also finish cooking later. 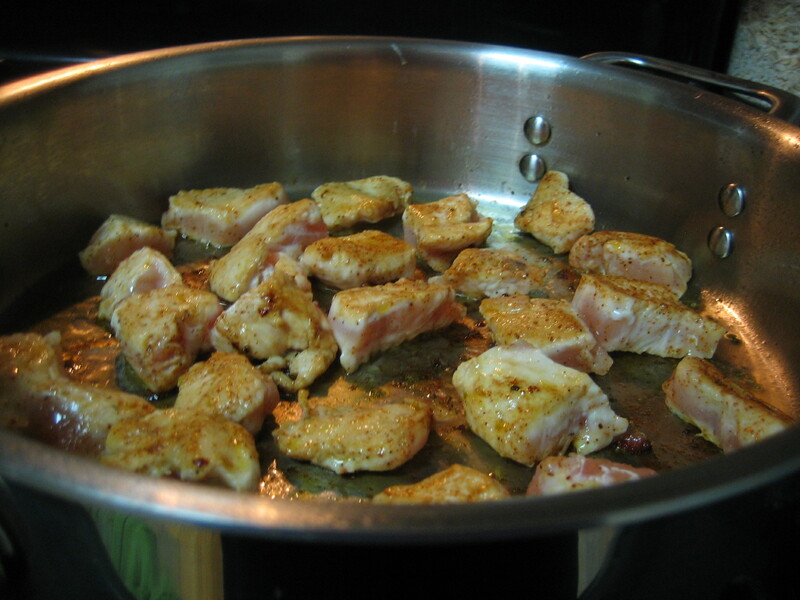 So they are really going in the pan to get a nice quick sear – then get them out so they dont over cook. Warning. The sausage will taunt you while you prepare everything else. Depending on how hungry I am, it could be half gone by the time we are ready to add it back to the dish. So lets deal with the veggies. 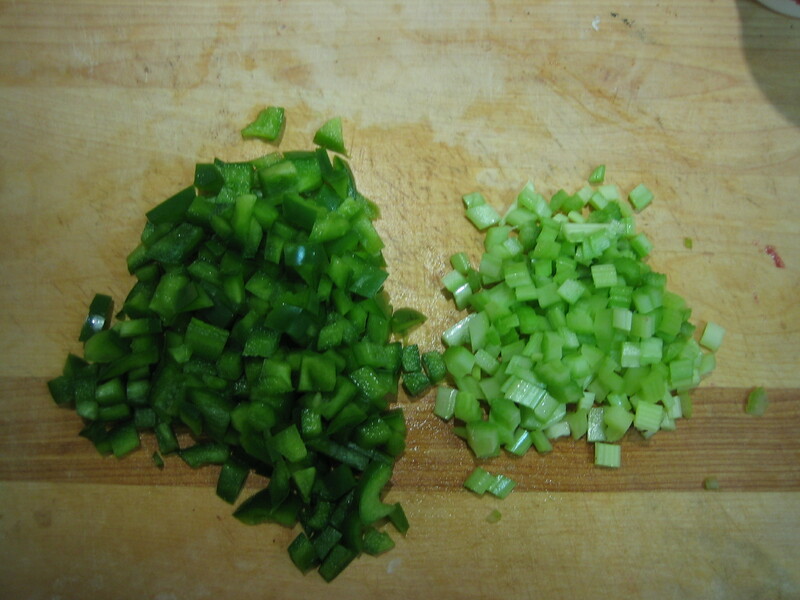 Onion, green pepper and celery are known as ‘the trinity’ in creole cooking. And garlic is known as ‘ the pope’. Coincidentally, there is a restaurant down the street called ‘trinity and the pope.’ A nickel for anyone who can guess the type of cuisine they serve. For this recipe, I use a scant cup of diced onion, a heaping cup of chopped green pepper, and about 1/2 cup of diced celery. I get the onion going first. Depending on how much oil you have left from browning all your meats, you may need to add a little extra at this point, but probably not too much. 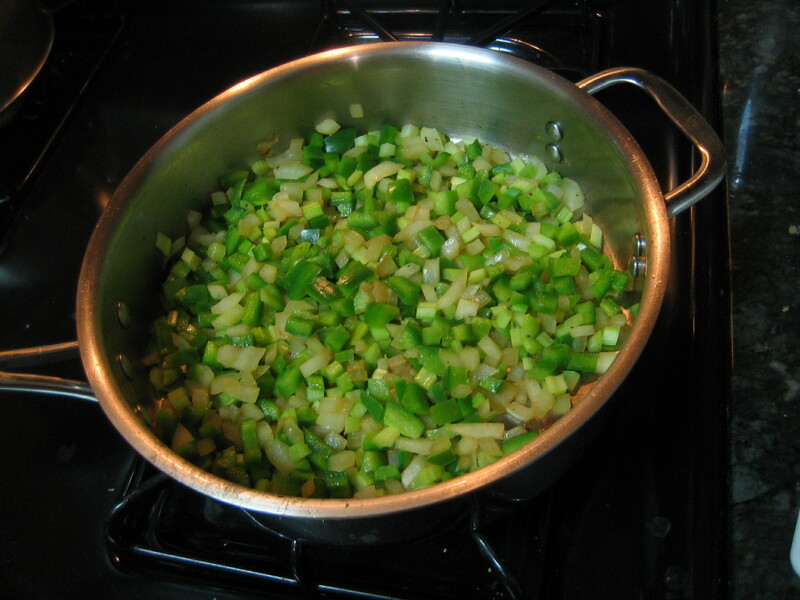 The onions will cook for 3-4 minutes, then you can add your green pepper and celery. Then cook 3-4 minutes more. You can add a little salt at this point to help the veggie release some water. But its already probably pretty salty from the creole seasoning left behind from your meats, so dont dump in the salt blindly. Taste, taste, taste. After the veggies have cooked down, add a big ol’ pile of garlic. This was 4 cloves, or about 3 tablespoons. 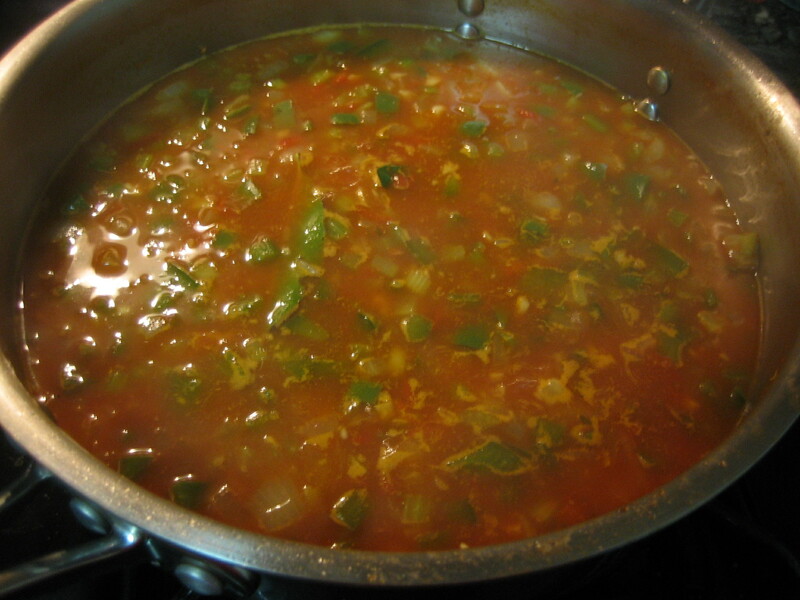 Once that is nice a fragrant, add 1/2 cup – 3/4 cup of crushed tomatoes, 3/4 cups of brown rice, 1/8 tsp of oregano, 2 bay leaves and a pinch of cayenne pepper. The cayenne is optional based on how spicy you like things. You can always add it later if you’re afraid of going overboard. 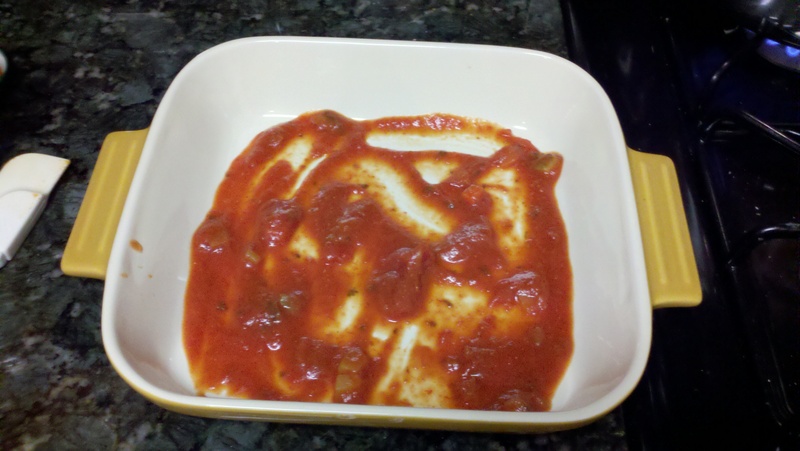 My crushed tomatoes were frozen, so I chiseled out what I needed. Thats why they look so weird. Also, feel free to use chopped or diced tomatoes. Phil doesnt love big chunks of tomato, so I always get the crushed – but I cant see why the form of tomato would make a huge difference. So mix that all together and cook maybe 1-2 minutes (to defrost the tomatoes, in my case) and toast the rice a little bit. Then add your chicken stock and 1/2 teaspoon of worcestershire sauce. I am using a whole grain brown rice (not instant). So this requires a fair amount of chicken stock and a longer cooking time. But if you have a quick cooking rice, use that. Just pay attention to the liquid required on the back of the box and dont pay attention to my measurements. The only thing is, since you are simmering this uncovered, you will most likey need at least 50% more liquid to cook the rice all the way through. For my .75 cups of uncooked rice, I used 2.5 to 2.75 cups of chicken stock (back of the box originally recommended a 2-1 ratio). 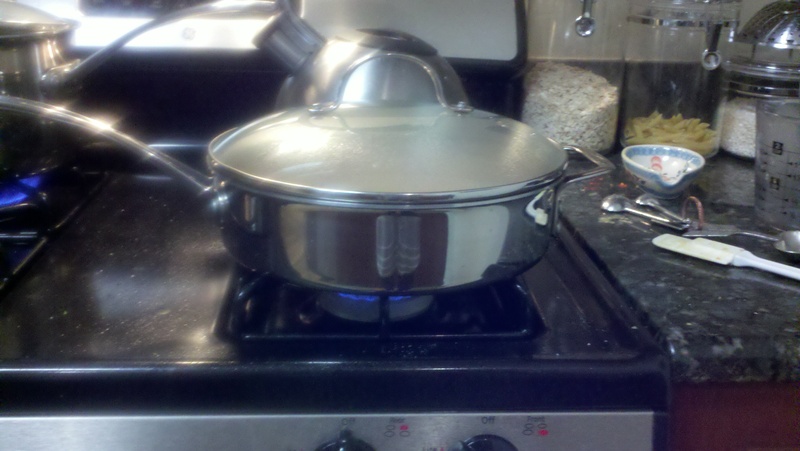 So I brought the liquid up to a boil, then reduced down to a simmer for 25 – 30 minutes. (And tried my darndest to not eat all the andouille in the mean time…). This is a good time to taste what you got going on though, and decide if you want it spicier or saltier. 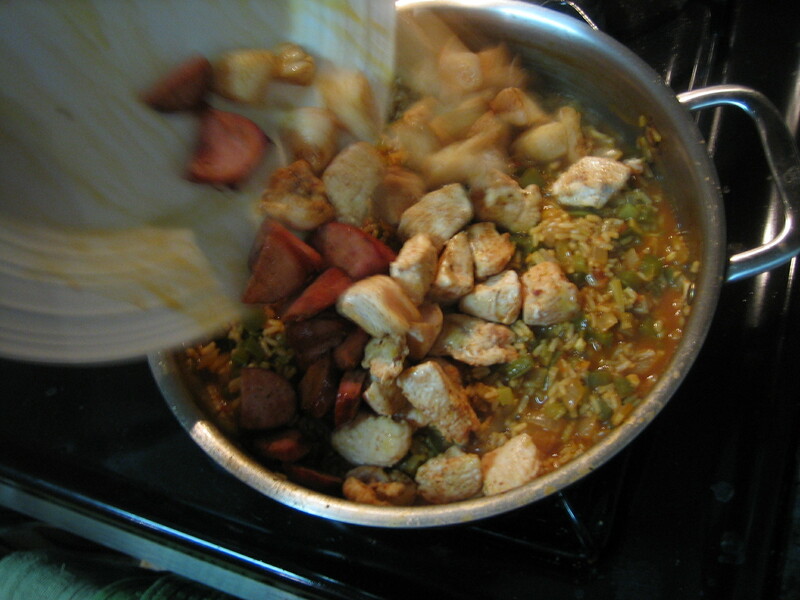 I added a second dash of cayenne and a 1/4 teaspoon of extra creole at this point. 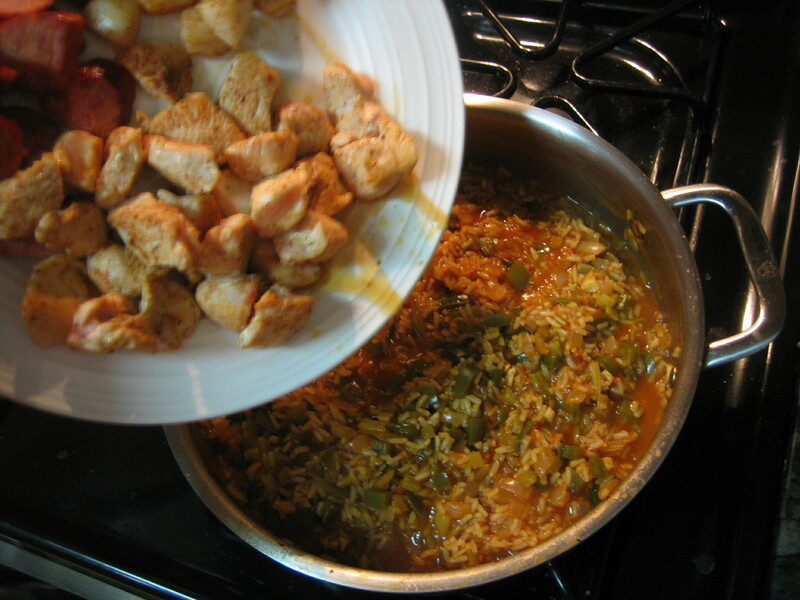 Once your rice is almost done, you can add your plate of meat back to the pan and remove your bay leaves. Cook all together for the last 5-10 minutes until the rice is all the way done and your chicken and scallops have finished cooking. 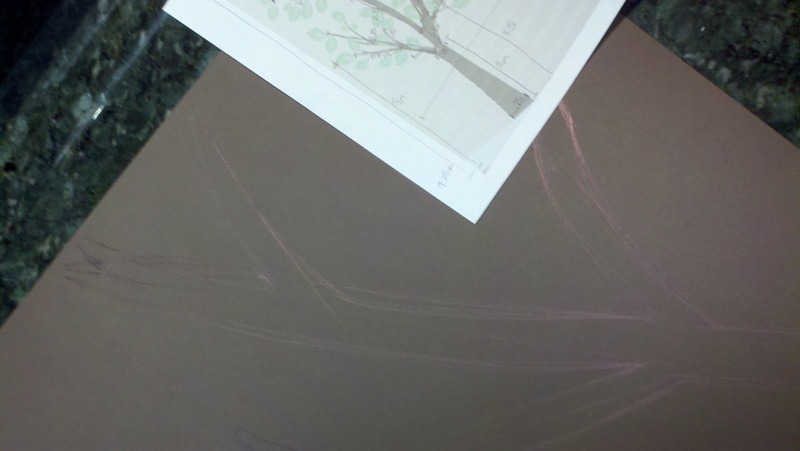 And the final product will be amazing. Confession. This meal only served 2 portions that given night. 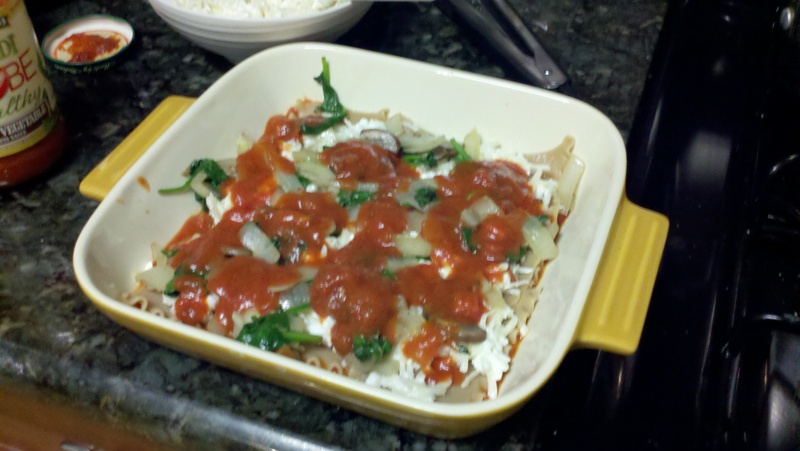 We usually at least get dinner and then some leftovers, but it was just too darn good! If I was having people over, I would double this recipe and make it in a big stock pot. I think a double recipe could serve 6 people. But maybe thats wishful thinking! 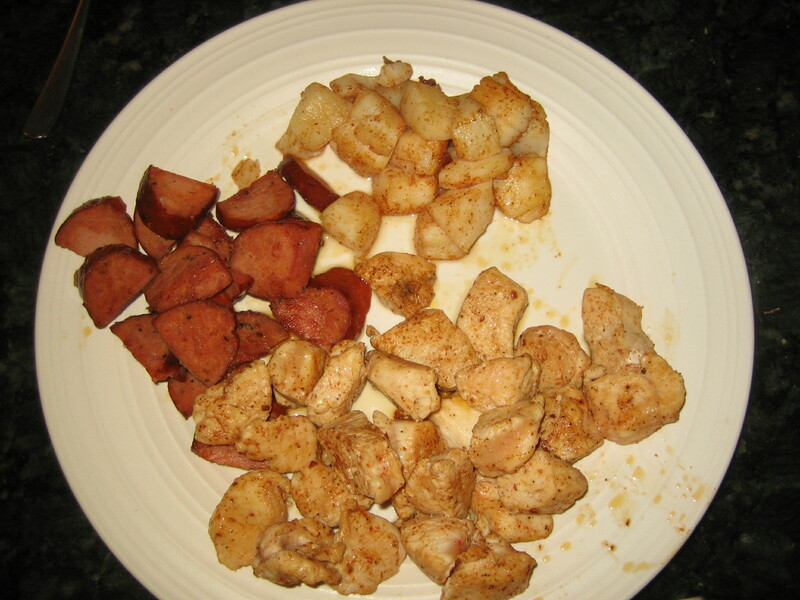 One at a time, brown andouille sausage, bite sized chicken, and scallops in large pan and remove to plate. Set aside. 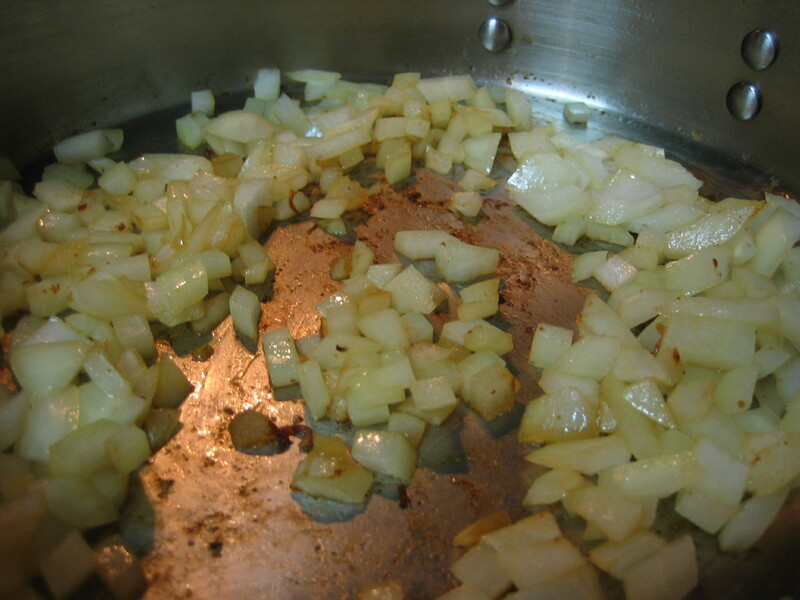 Add diced onion and a little bit more oil (as needed) to pan and saute 3-4 minutes. 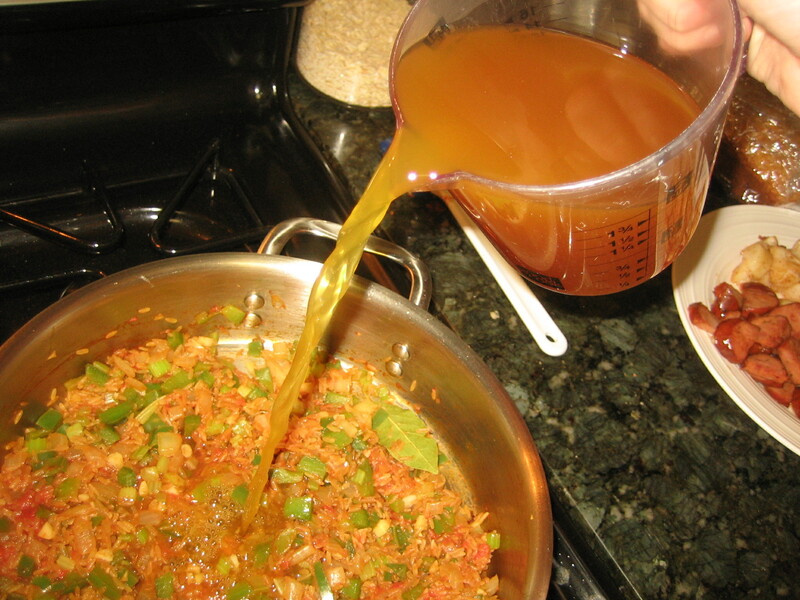 Add green pepper and celery and cook 3-4 minutes longer. Add garlic and cook for 1 additional minute. 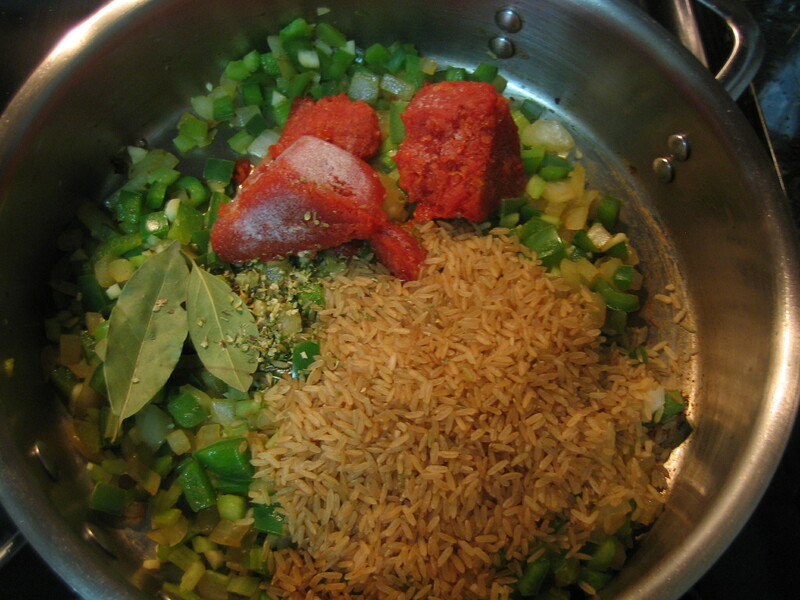 Next add rice, tomatoes, bay leaves, oregano, and cayenne. 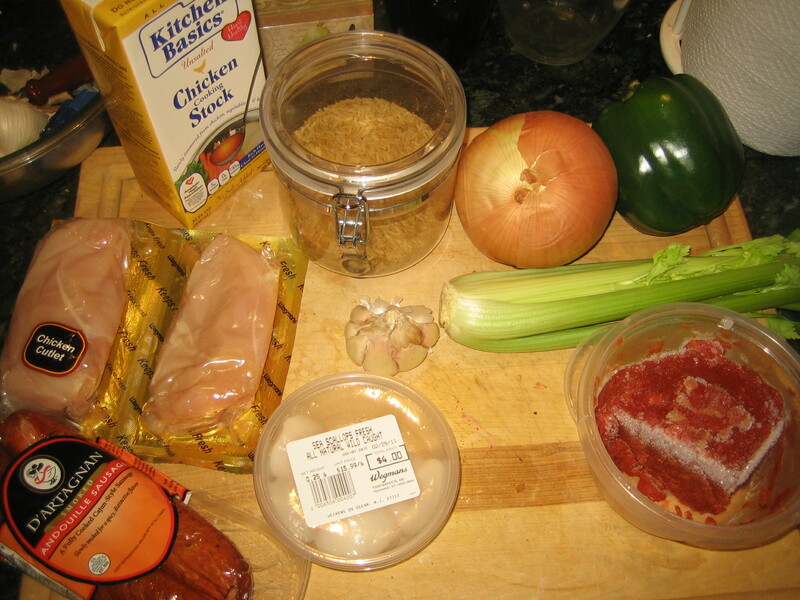 Cook together for 1-2 minutes then add your chicken stock and worcestershire sauce (Pay attention to the type of rice you are using. Follow instructions on back of box, but you will need slightly more liquid). 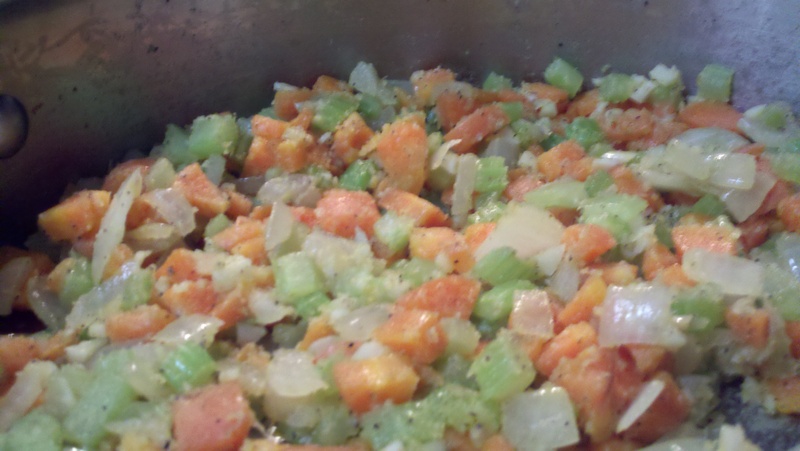 Bring everything up to boil, then reduce down to simmer and cook uncovered. In my case, this was 25 – 30 minutes. But could be much less depending on brand of rice. Lastly, add meat back to mixture and remove bay leaves. 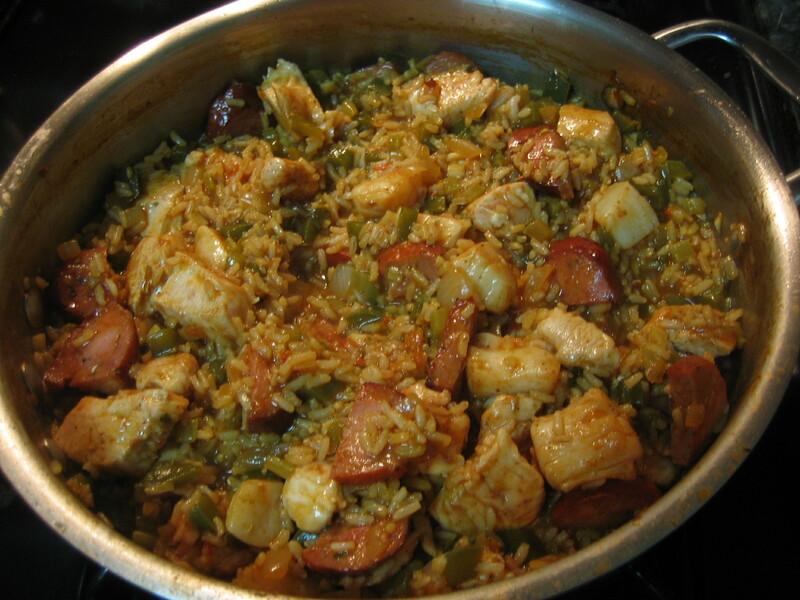 Cook until meat is done all the way through and rice is soft (5-10 minutes). Nom. Nom. Nom. 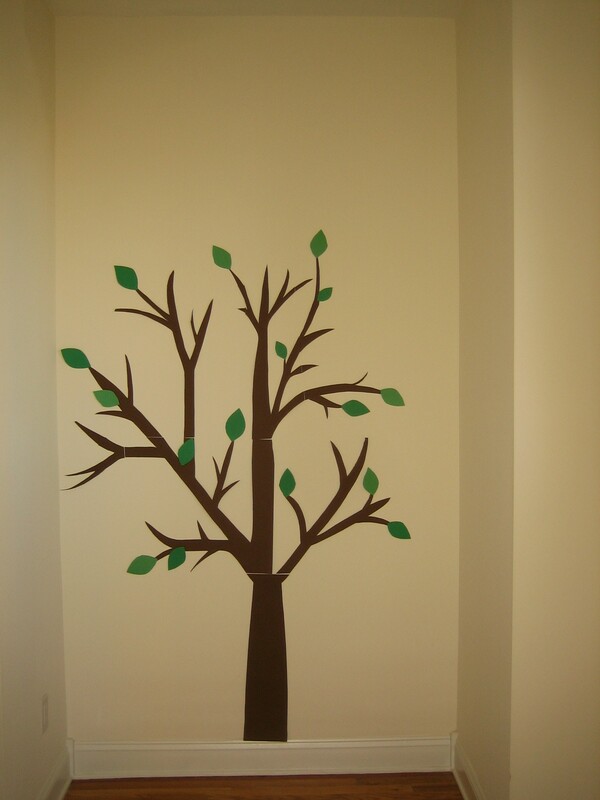 These arent nearly as exciting as the tree mural, but Im still pretty proud of them. 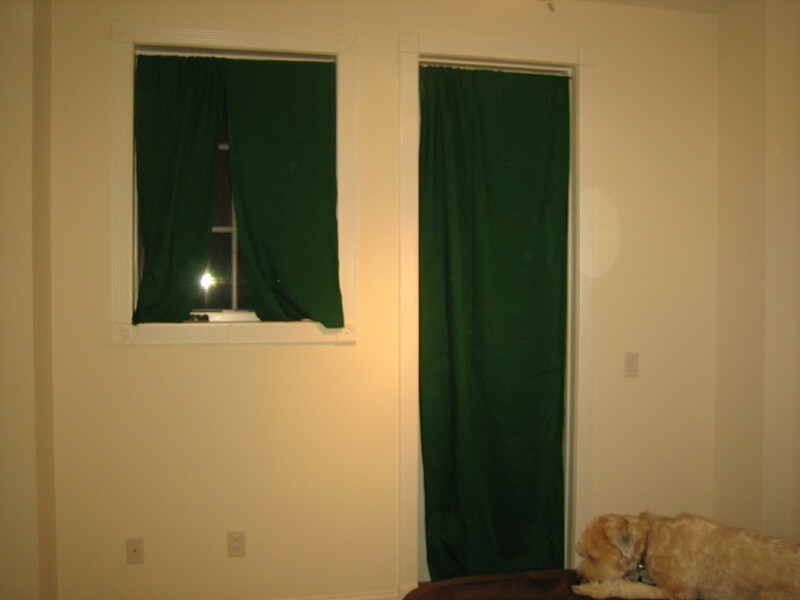 We have 96′ and 46′ windows in the spare room. 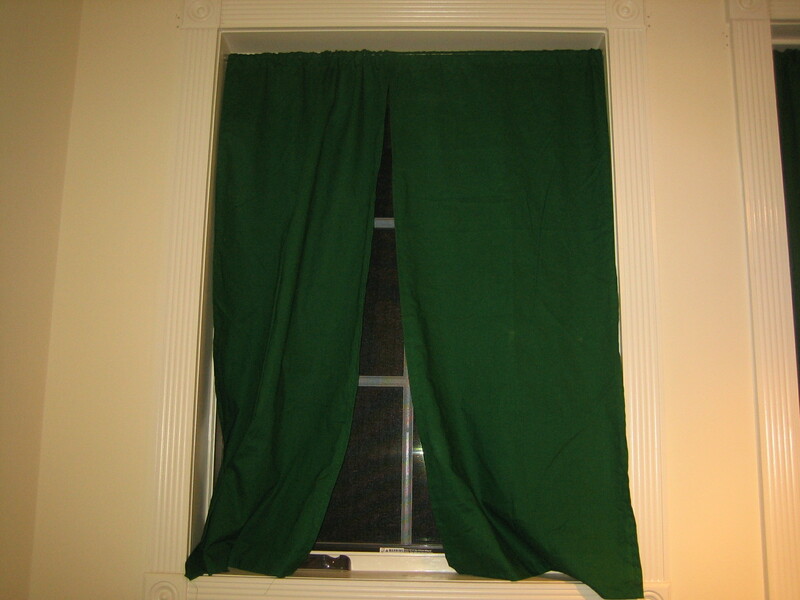 And it is very hard to find curtains at that length, let alone at a decent price. 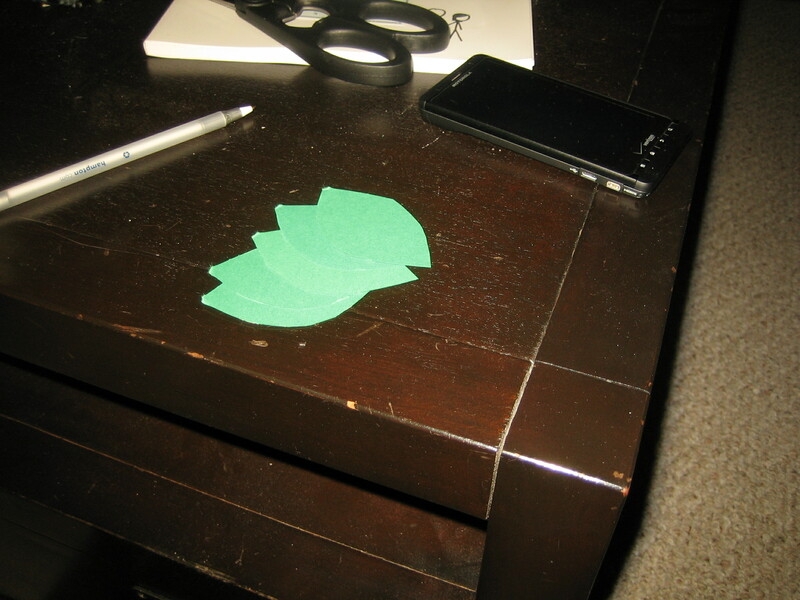 Plus I wanted them to match the green from the tree. 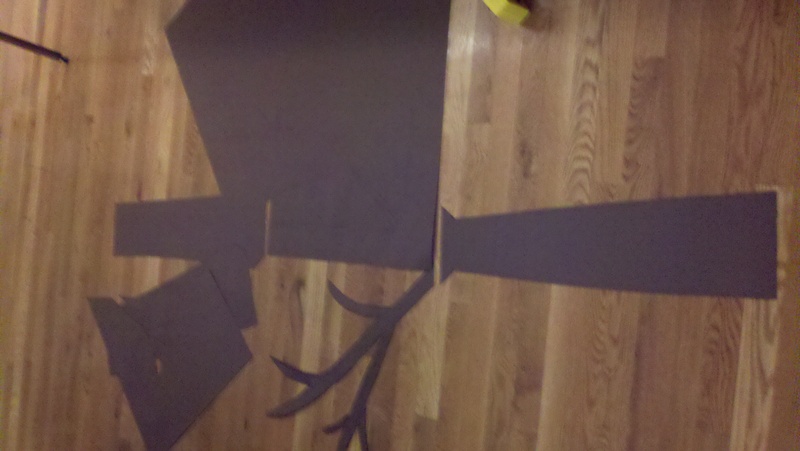 I couldnt find anything close at the lengths I needed, so I figured Id make them. 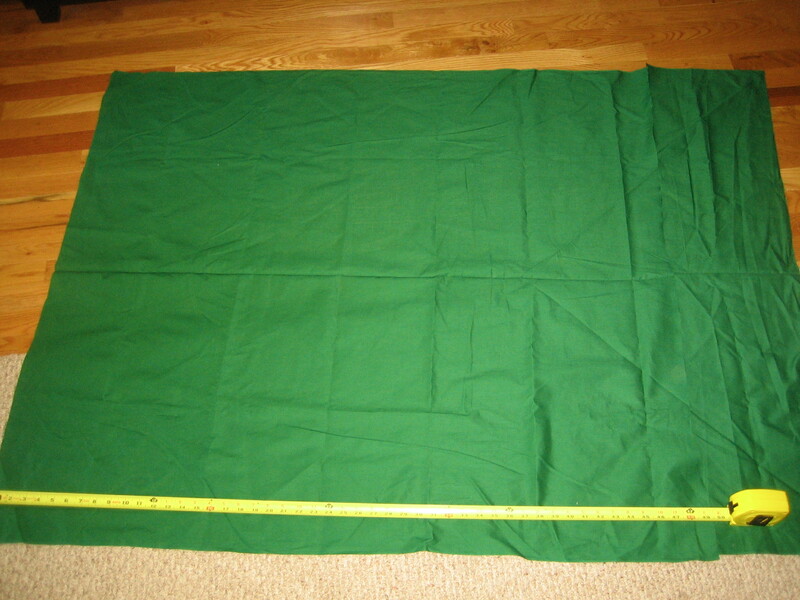 Then measured my length and seams. I am using suspension rods to hang these. 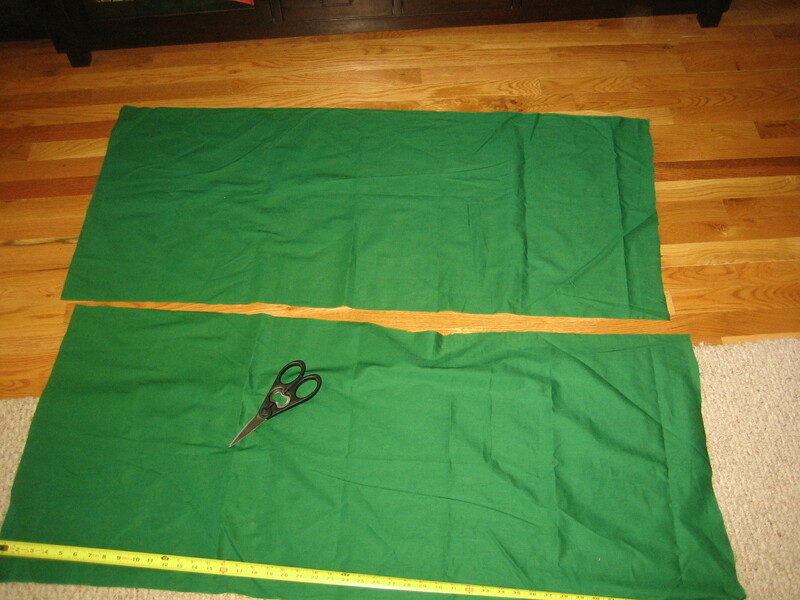 So really all I needed to do was fold in all the sides and stitch them up, leaving one side with at least a 1 to 2 inch fold over to insert the rod. 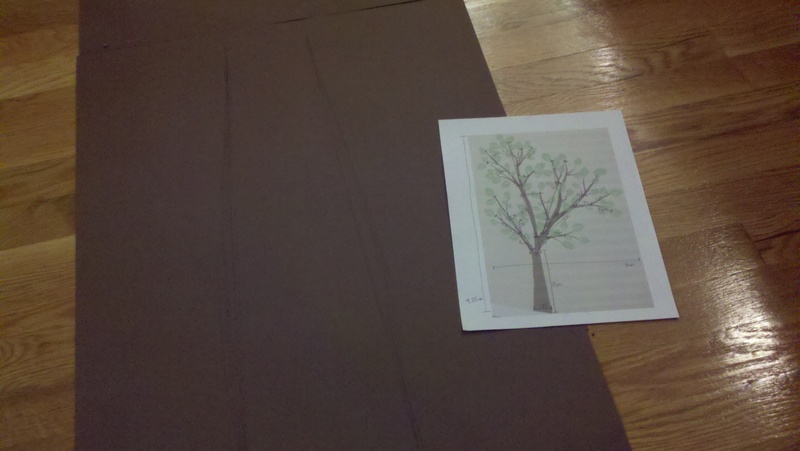 Im a little embarrassed to say that I sewed all these by hand. 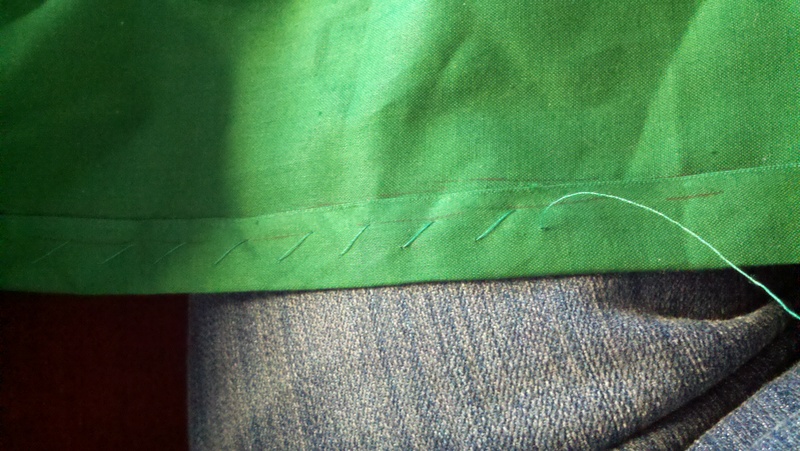 It would have taken like 2 seconds for anyone with a sewing machine. 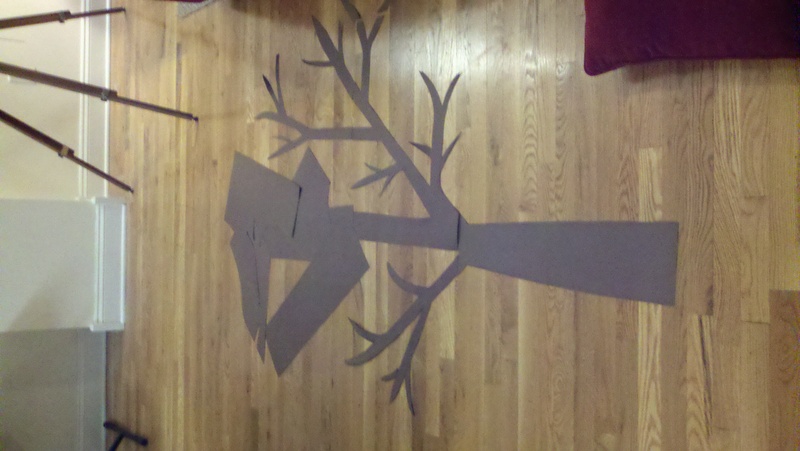 But I was super bored with Phil gone, so it provided me with some mindless activity and fulfilled my nesting urges. 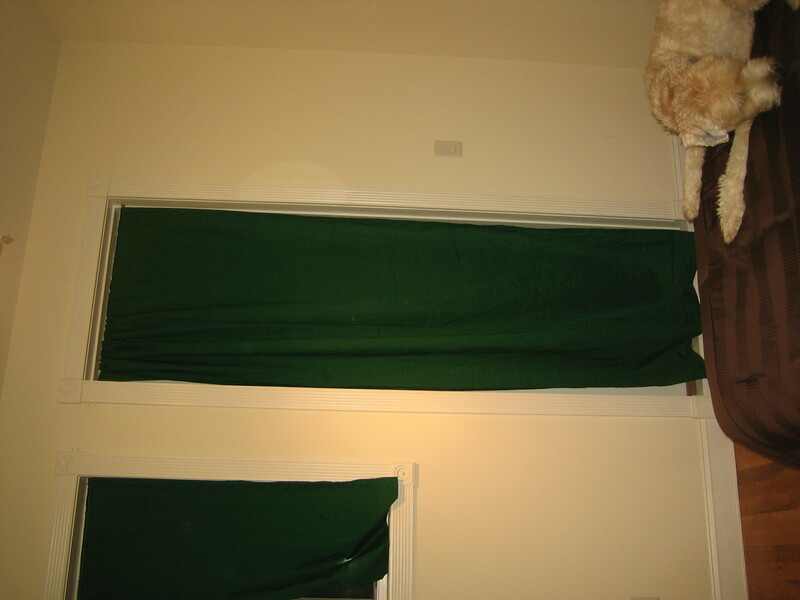 But in the end, no matter what the method, we now have new curtains of the appropriate length that match the leaves on my tree mural. Win. Win. Win. The color looks different depending on the time of day and flash I was using. But I am really happy with how they turned out (though Barney does not look amused in the last few photos). Ill probably use some white ribbon to tie them back during the day. 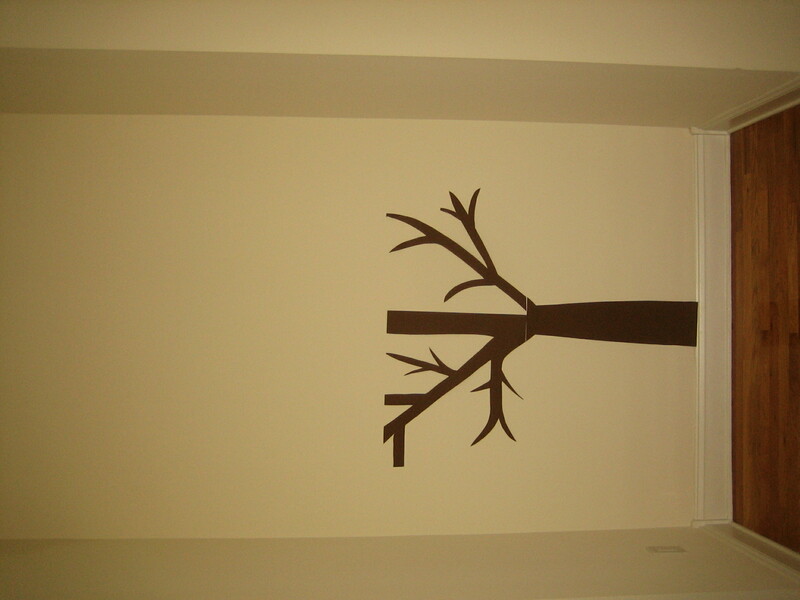 Only a few more things to decide before we finalize the nursery! 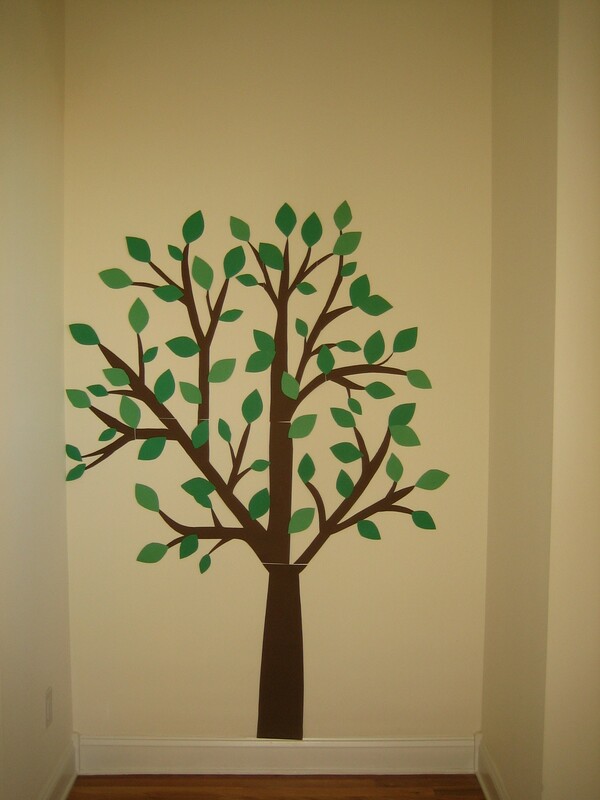 Since phil and I will be moving to baltimore a few months after the baby is born, we didnt want to spend a whole lot of time or energy (or money) on a nursery here in new jersey. 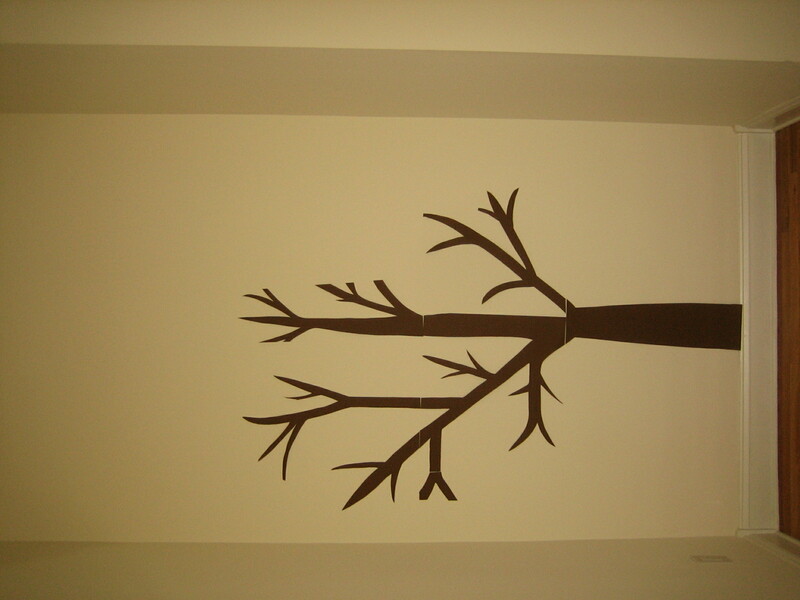 But I still wanted to revamp the spare room into a baby friendly place. 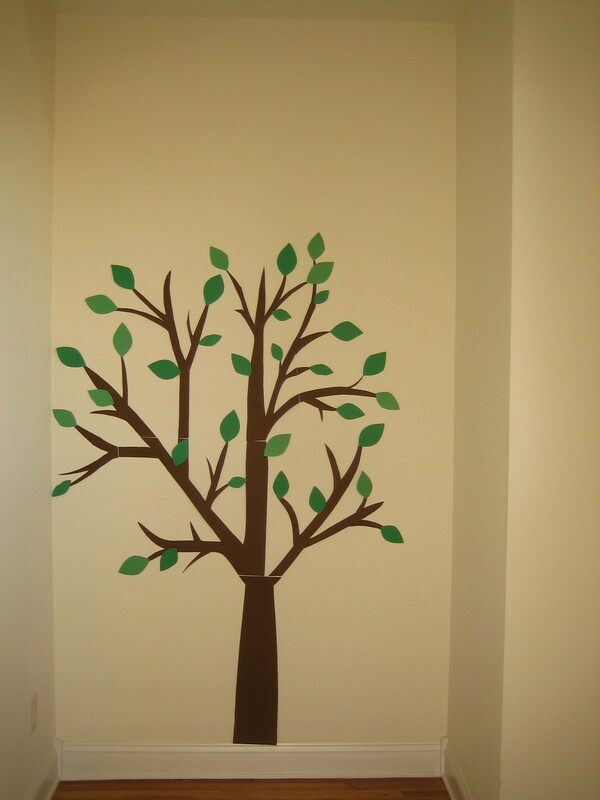 I decided a ‘Tree’ motif with green and brown colors would be a good compromise for our spare room/nursery combo. 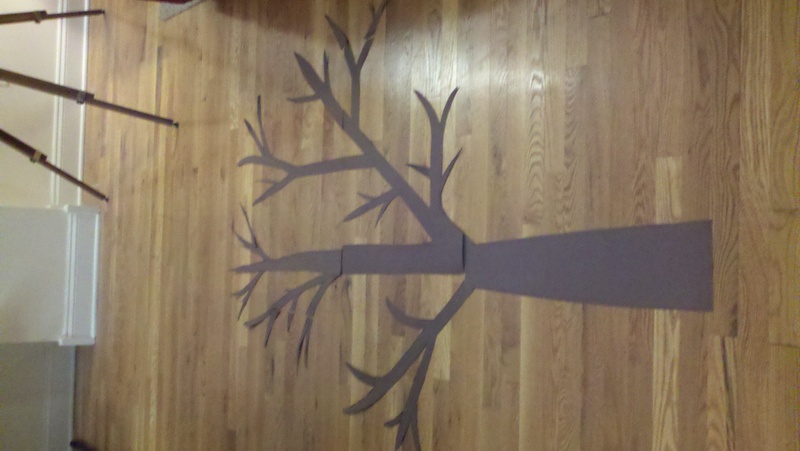 It seemed whimsical enough without being too over the top. 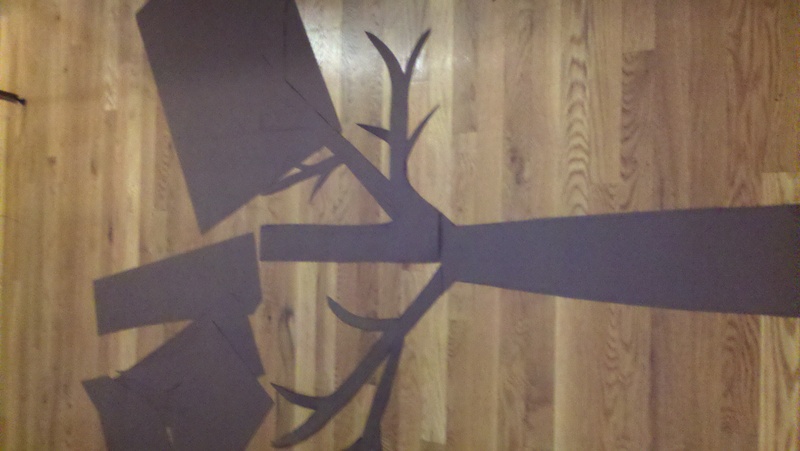 Plus, phil and I had our first kiss in a tree about 8 years ago. So I thought it was kind of romantic, too. 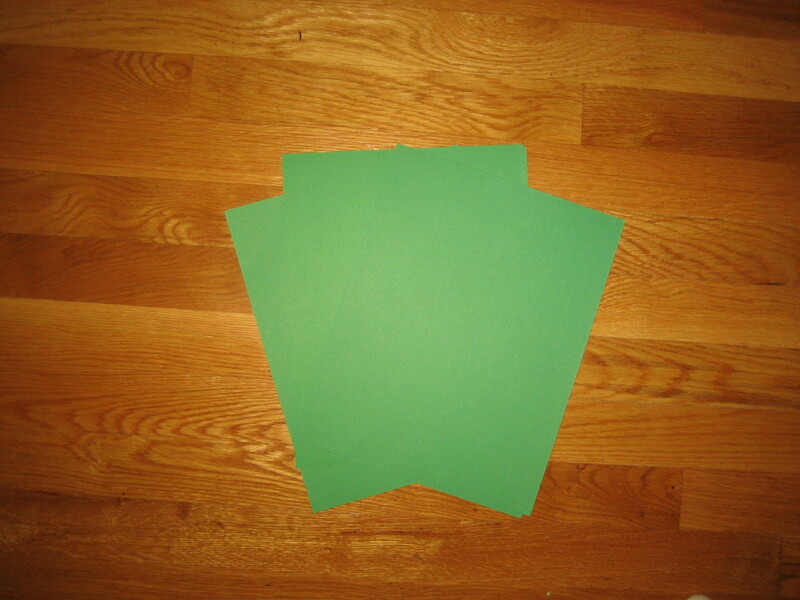 Two unforseen problems were that (1) I ran out of green paper and had to go buy a bit more and could not find an exact match. 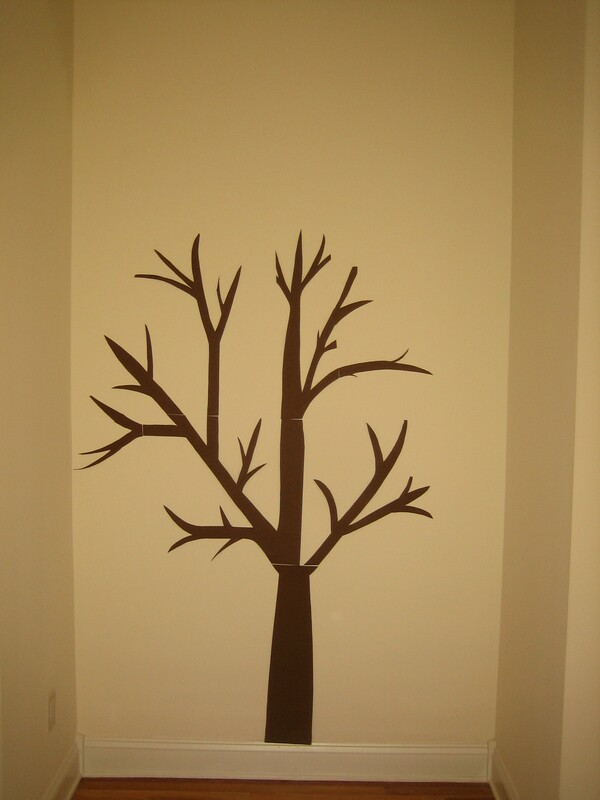 But the two were really close but just different enough that I actually think it helped give a little dimension to the tree. So it turned out to be a good thing. 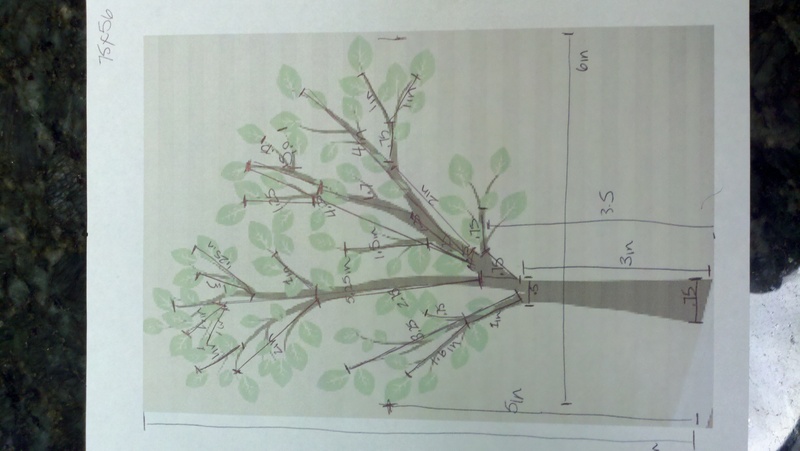 And (2) all my pen markings from drawing the tree were on the ‘outside’ of original plan, so I had to flip the design over and the final product is a mirror image of the original image. Im pretty happy with it! 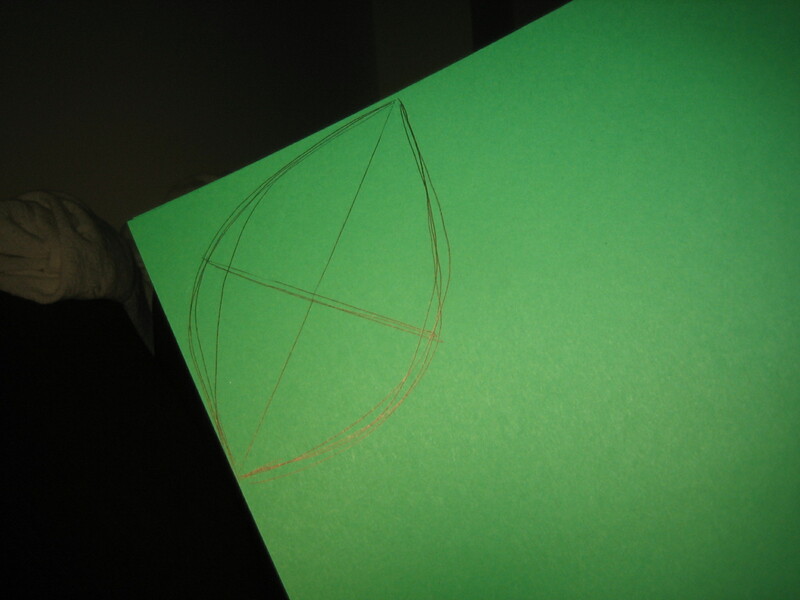 I mean, its not perfect, but for my skill level and less than $10, Ill take it. 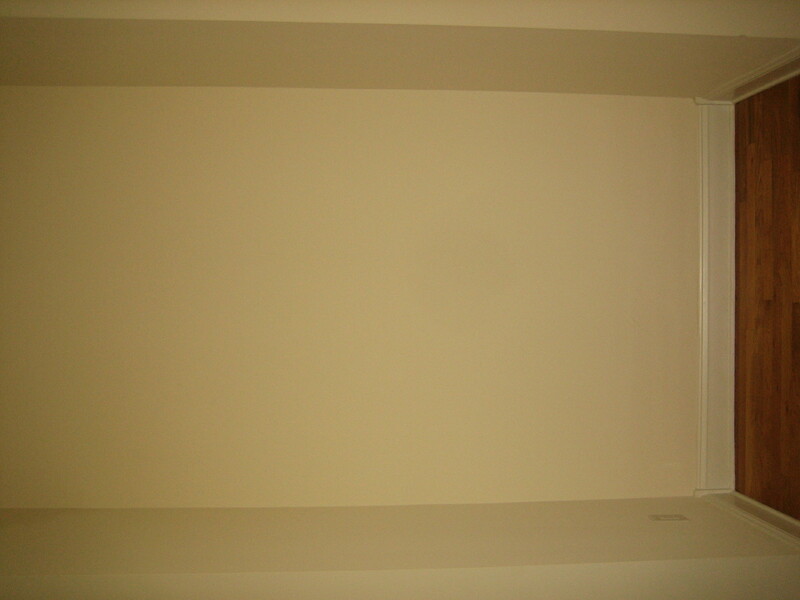 We cant decide if we are going to buy all our nursery furniture ahead of time and set it up in this room for a few months. Or try to get by with just a bassinet in our bedroom while we are in new jersey then buy the nursery furniture once we get to baltimore. Regardless, we will probably set up a small basket/bassinet/crib in this little nook, under our tree, as a secondary sleeping location. 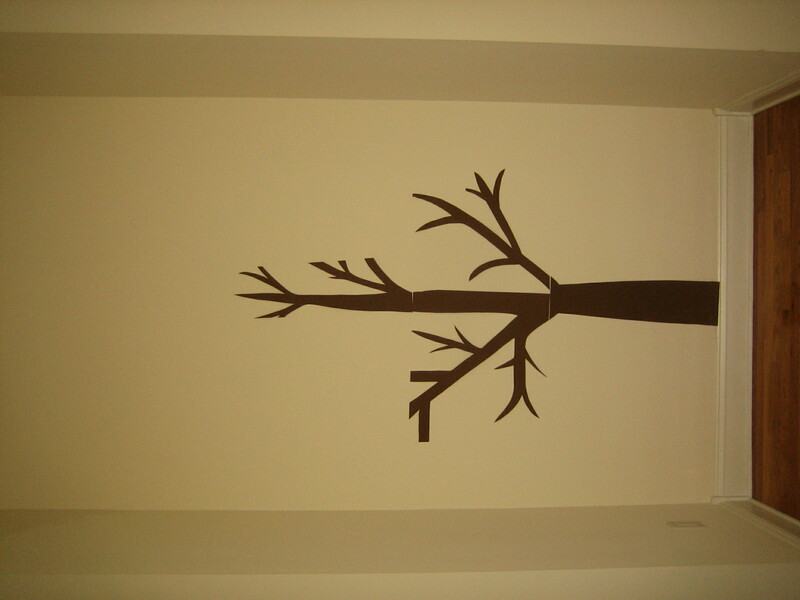 Along with a dresser/changing table on the other wall. 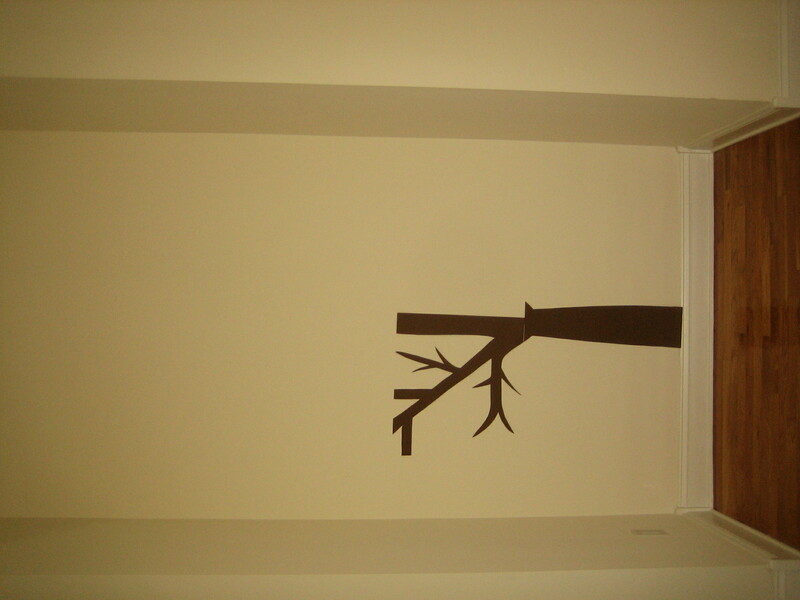 I will do a full before and after post on the nursery once we have finished it up! This meal was actually the motivation behind cataloging my recipes. Its one of our favorites and Phil decided he wanted to make it for his family when he was back in Bloomington a few years ago and asked me how. And I had NO CLUE what to tell him. ‘Ummm…some carrots, celery, peas. Then some chicken stock? 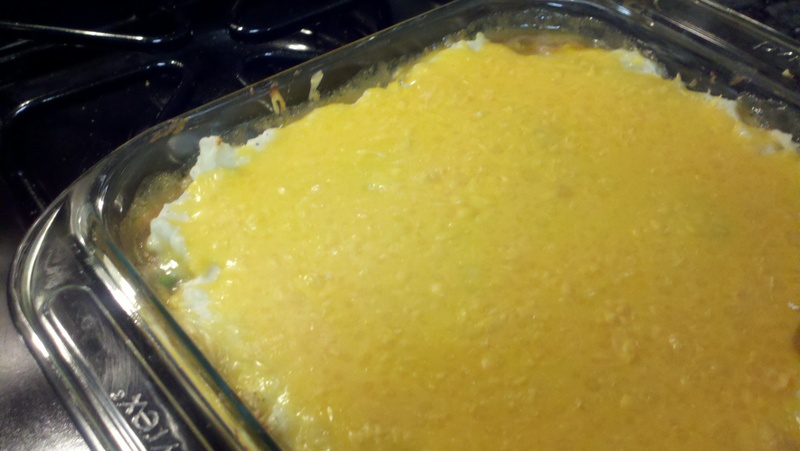 Top with mashed potatoes and cheese, then bake it for awhile’. If you can imagine, it did not turn out well. And I decided I should start writing down my recipes. Welllll, finally 2 years later, I am getting around to it. Now, there are a million different variations of this meal. I do not think I have made it the same was twice. We use to eat this with a pound of ground turkey in the mix, but have slowly scaled back the meat over the years and we now eat this without any meat at all. 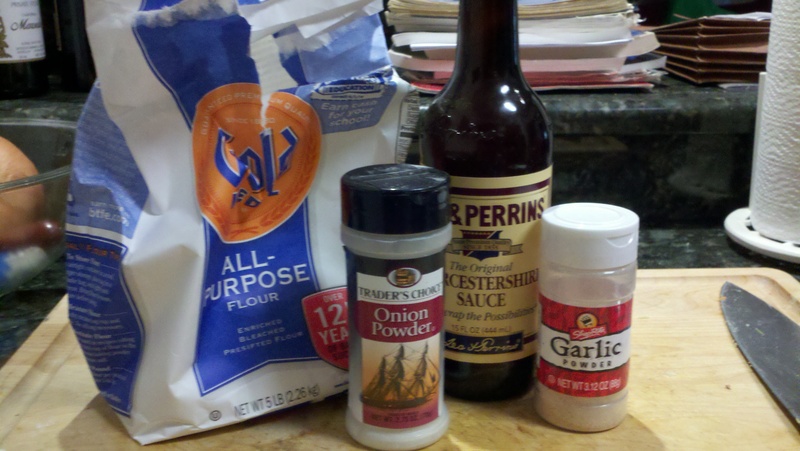 (However, its still not technically vegetarian since I use chicken stock and worcestershire sauce. 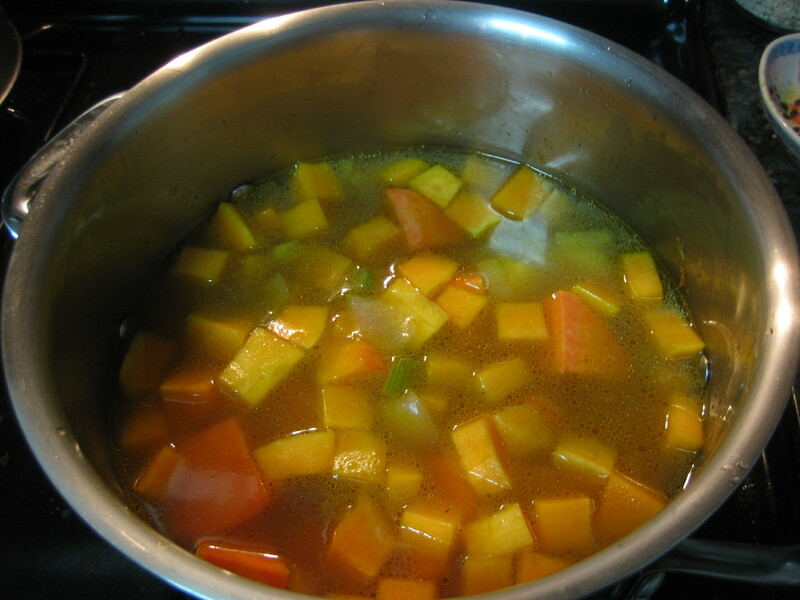 But feel free to use vegetable stock and omit the sauce if you want to go vegetarian. And just leave off the cheese to make it completely vegan!) The peas and cheese add quite a bit of protein, but feel free to use some chicken or ground turkey to add a little more heft to it, if you please. Now, I’ll warn you – this recipe is a bit demanding. You are going to chop, peel, shred and mix. It takes about 35-40 mins of work, then you bake for 20-25 mins. So this probably isnt a quick meal you whip up when you get home after a long day. 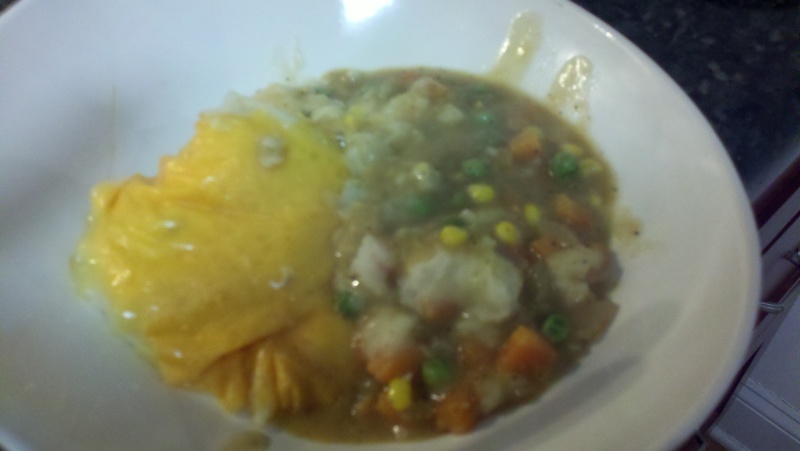 But it is delicious and a quintessential comfort meal if you have the time. These large chunks filled about 4 cup fulls. Then I toss them in some water on the stove top and turn up to high heat. I also ‘half-cover’ them. This helps keep in some heat, but wont cause your pot to bubble/foam over when the potatoes really get cooking. Then I get started on the vegetables. 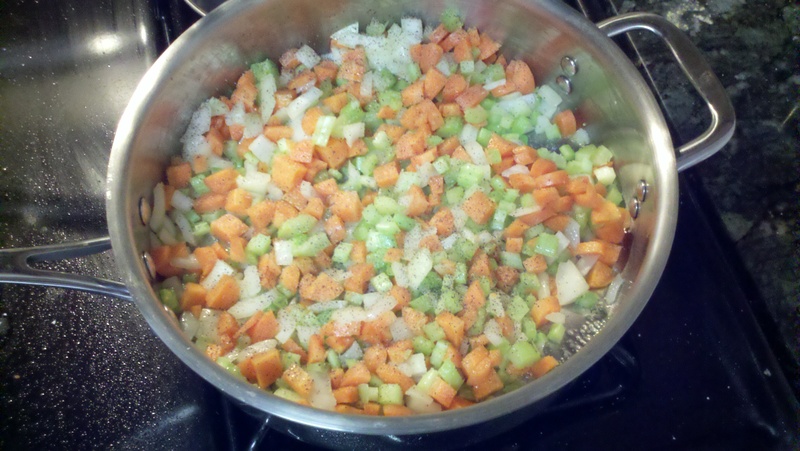 I diced up half a large onion (~1 cup), 3-4 carrots (~1.25 cups), and 3-4 celery stalks (~1 cup). 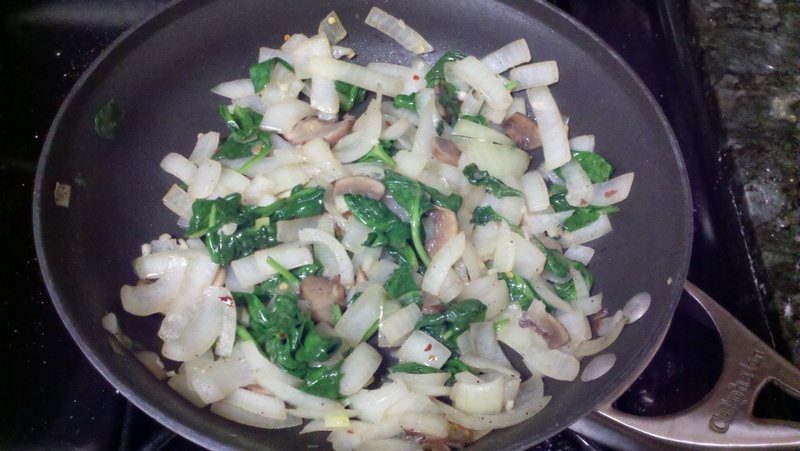 Then toss those all in a large skillet to saute over medium heat for 5-6 minutes. (Fun fact: any time you use the combination of these 3 vegetables its known as a ‘mirepoix’). Add a little salt and pepper. Im using store bought stock this time, so I was careful on my salt. 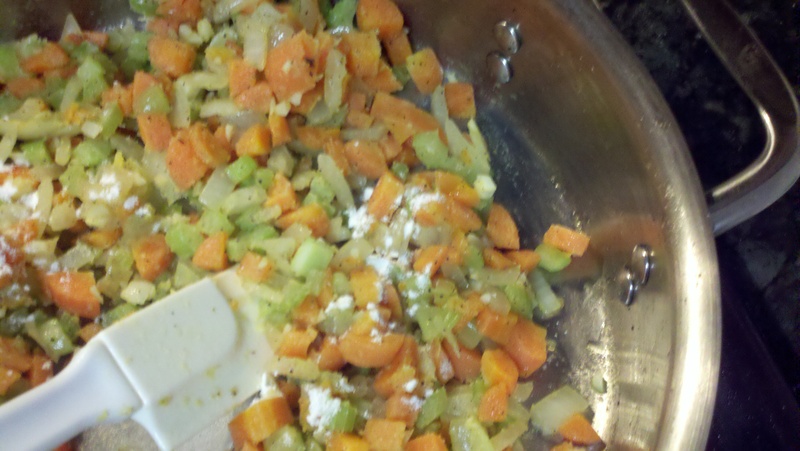 After the veggies have softened up, add 3- 4 cloves of minced garlic (~3 tablespoons) and cook a minute longer. Then you are going to add about 2 tablespoons of flour. This is going to mix with the olive oil from your saute and create a roux. It will temporarily put a film on your veggies, but thats okay for now. It will mix in with the stock soon enough. Cook for about 3 minutes, until the flour has mixed in well with all the left over oil. Then add in 1 cup of chicken stock and 1 tablespoon of worcestershire sauce. 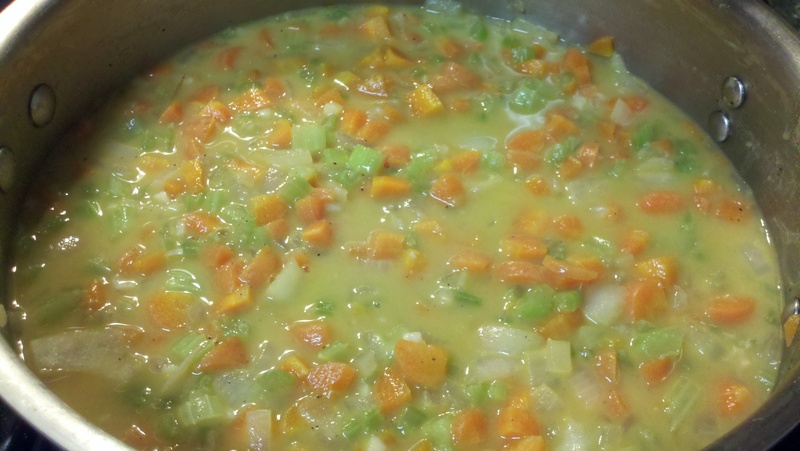 Now bring the mixture up to boil, then cover and knock the heat down to a low simmer for 15-20 minutes. Now back to the potatoes. They should be about ready now, so go ahead and drain them and then put them back in the same pot. Anywho. To the potatoes, add 1/2 cups of milk, 1.5 tablespoons of butter, 1/2 tsp of garlic powder, 1/2 tsp of onion powder, 1/2 tsp of salt and a pinch of pepper. Then mix all together until creamy. 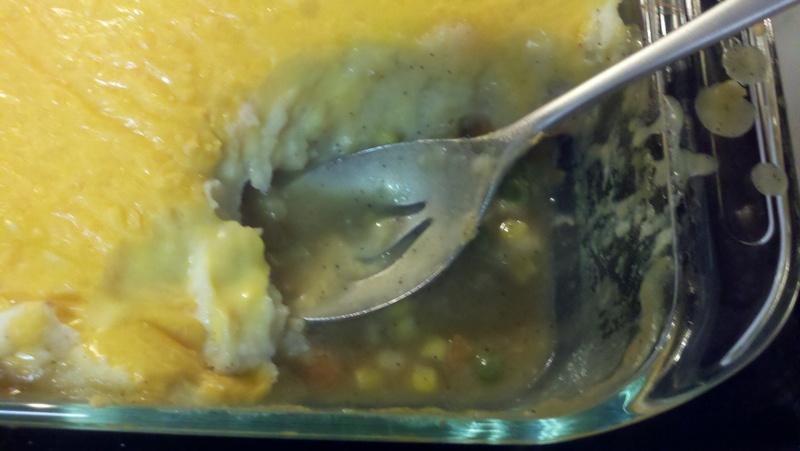 Side note – you can use any mashed potato recipe you want, but make sure its a pretty thick mix. It needs to stand on top of the veggies and not melt in. Woo. Finally got that action shot. Your potatoes are ready to go. 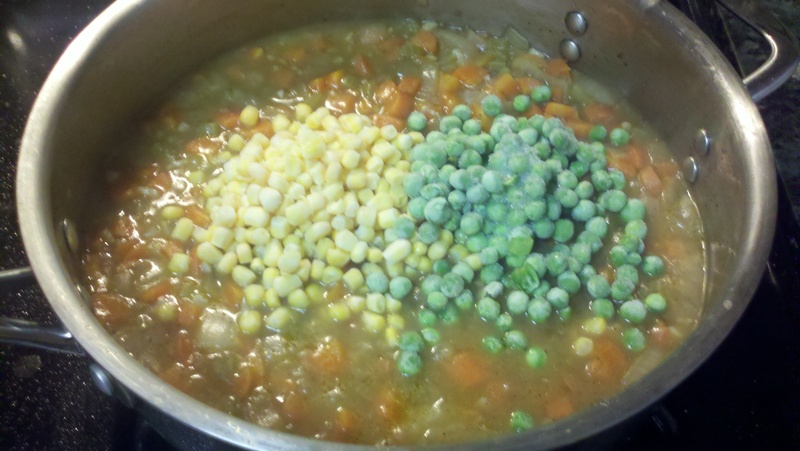 Once your veggies have simmered and cooked together for 15 – 20 minutes, uncover and add 1/2 cup frozen corn and 1/2 cup of frozen peas. 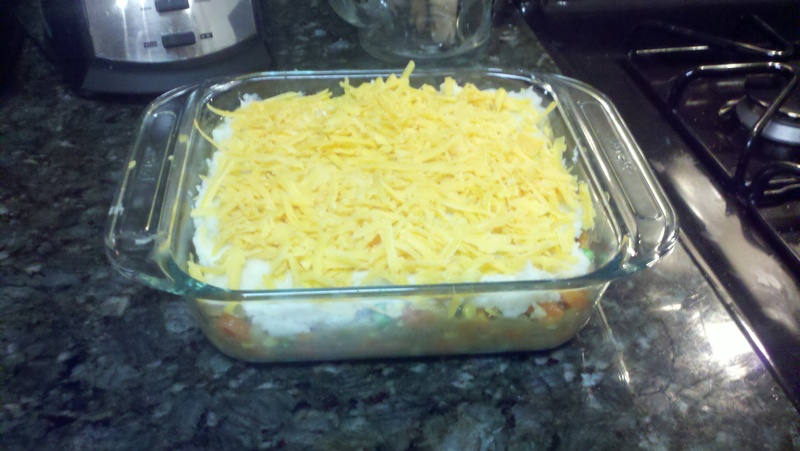 Stir together and put into 8×8 baking dish. 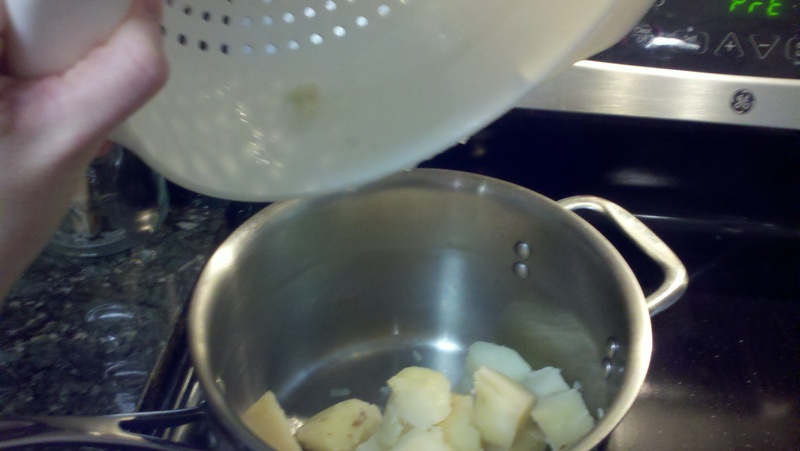 Then add the potatoes on top. 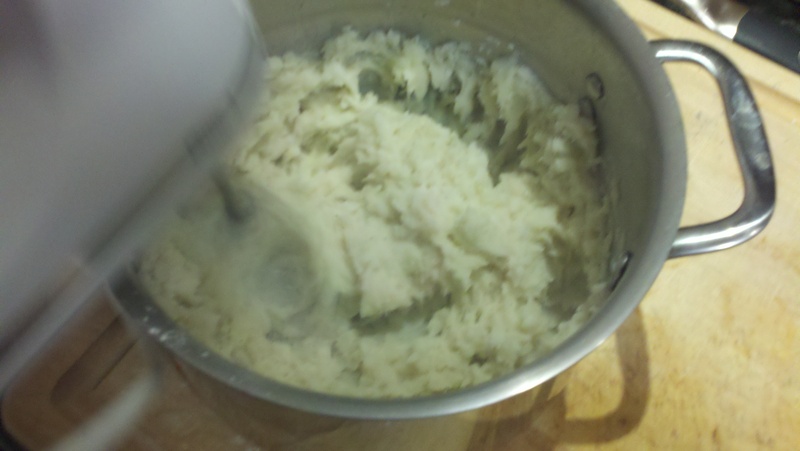 I put big globs of potatoes down, then carefully spread them out in a single layer. 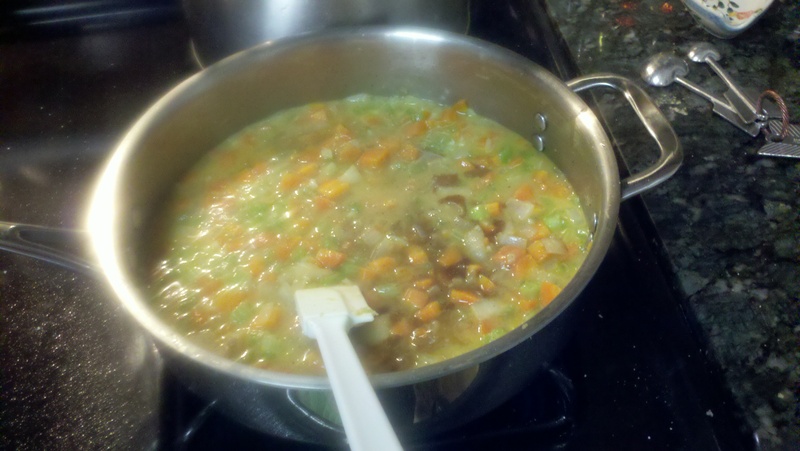 As you can see, its a pretty soupy mixture. This is how we like it. 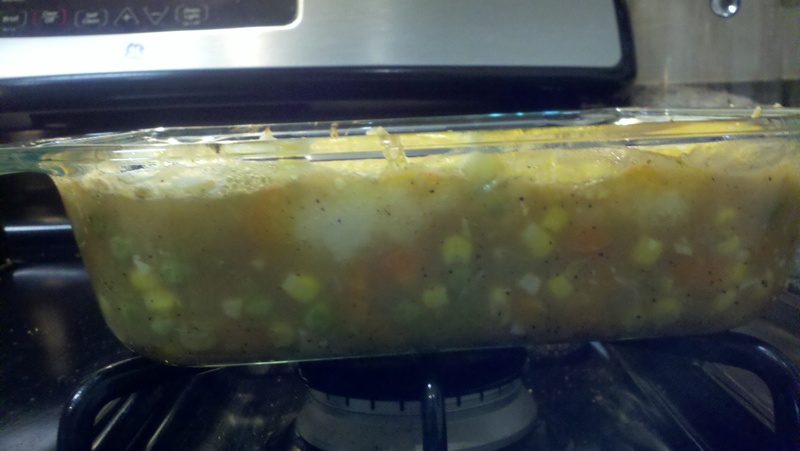 But if youd like it thicker, add less chicken stock or more ‘filling’ for the bottom layer. Enjoy! 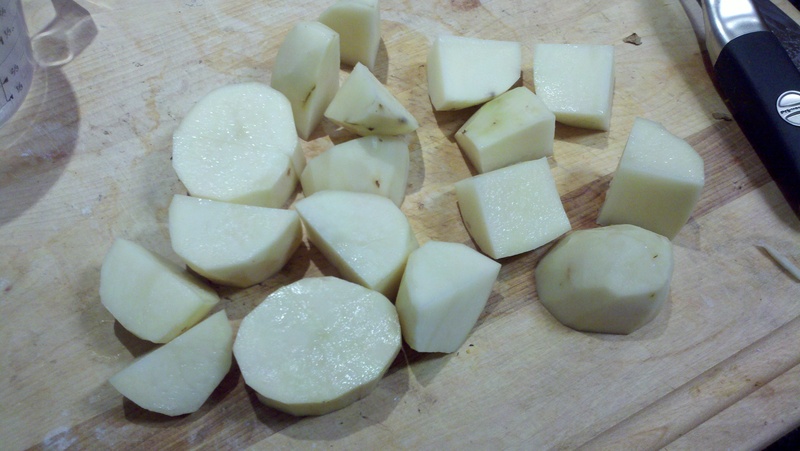 For mashed potatoes: Peel and chop 2 large baking potatoes and add to water on stove top. 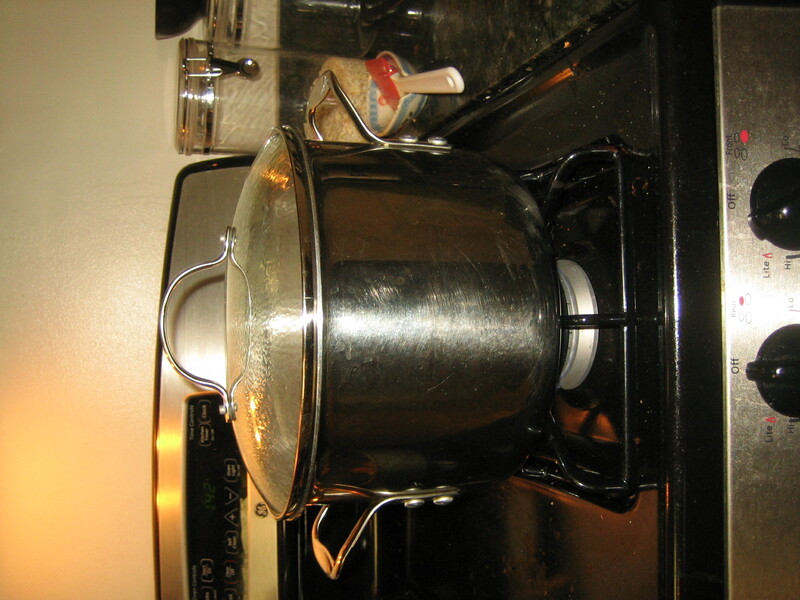 Boil for 15 – 20 minutes until tender. Drain and put back into pot. Add 1/2 cup of milk, 1.5 tablespoons butter, 1/2 tsp of garlic powder, 1/2 tsp of onion powder, 1/2 tsp of salt and a dash of pepper. Beat with mixer until creamy. Set aside. 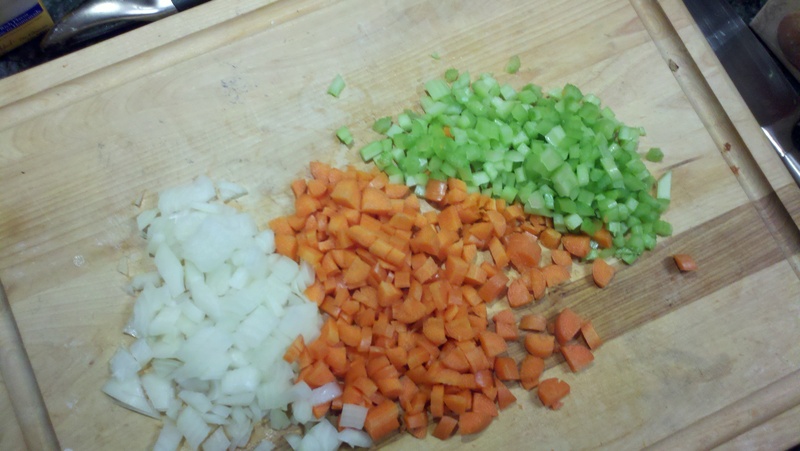 For filling: dice 1 cup onion, 1.25 cups of carrot, and 1 cup celery. Saute for 5-6 minutes on medium heat. add salt and pepper to taste. 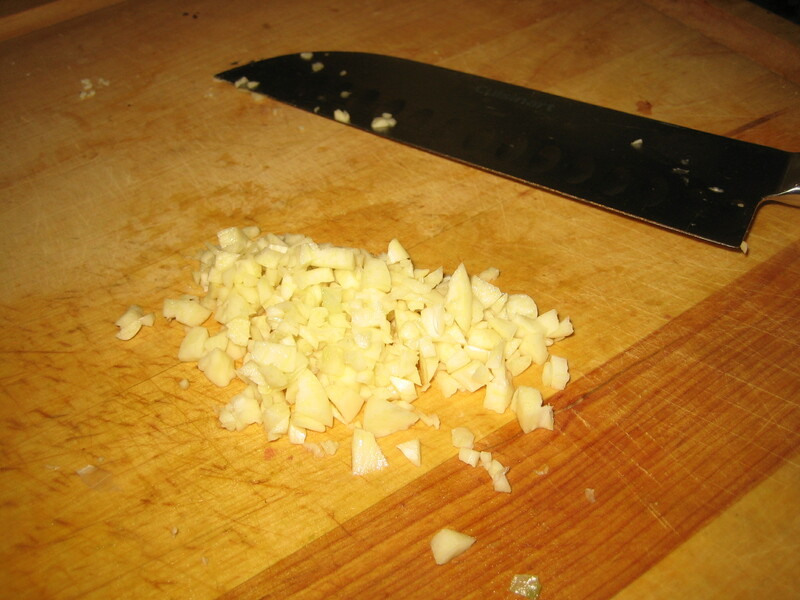 Add 3 tablespoons of minced garlic and cook for 1 minute longer. Add 2 tablespoons of flour, cook 2-3 minutes until well combine. Add 1 cup of chicken stock and 1 tablespoon of worcestershire sauce. 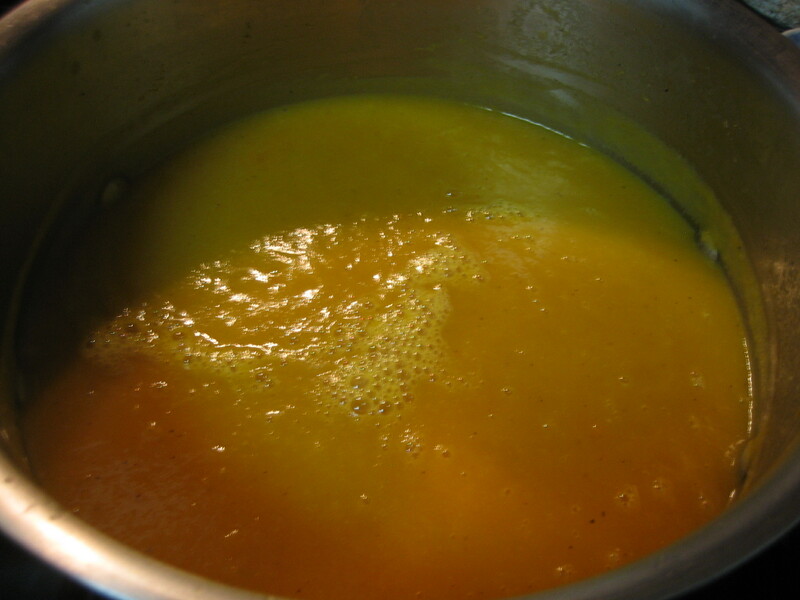 Bring to boil, then cover and drop to a low simmer for 15 – 20 minutes. 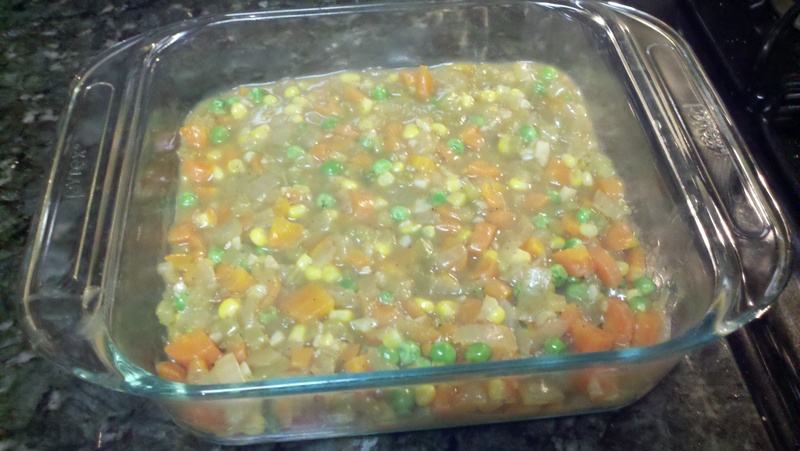 Uncover and add 1/2 cup of frozen corn and 1/2 cup of frozen peas. Mix together. Add filling to bottom of 8×8 baking dish. 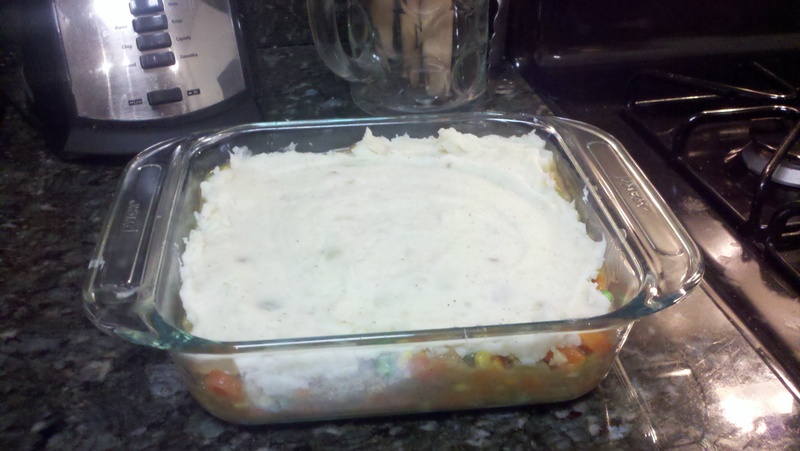 Top with mashed potatoes and spread out to a single layer. 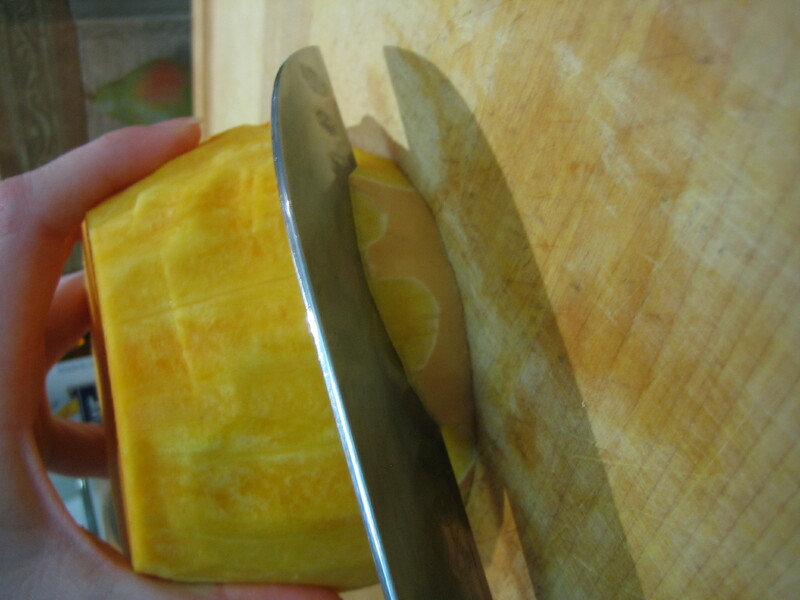 Top with cheese and bake, uncovered, for 20 – 25 minutes at 350 degrees. Self portrait on my way to prenatal yoga. All the girls in the class say that I look so small. 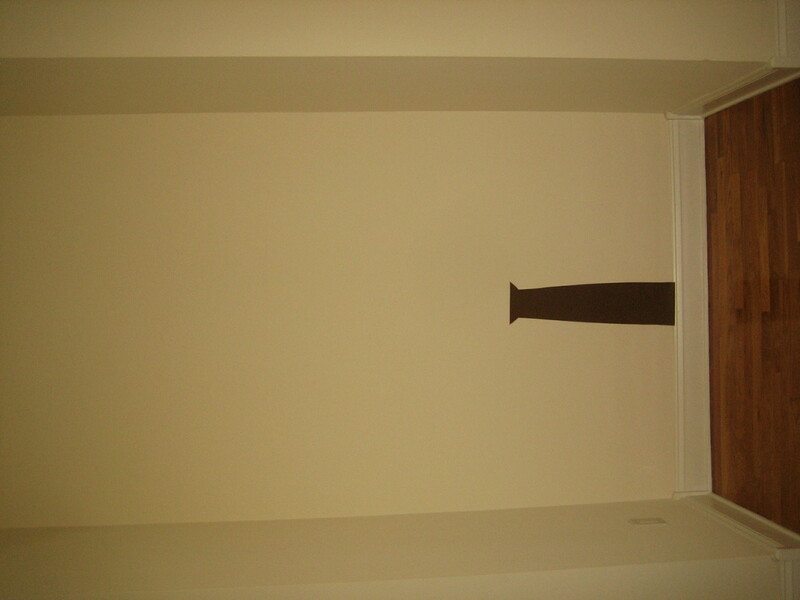 Of course its all relative – Im sure looking back on this picture in another 19 – 20 weeks Ill agree. But I feel huge right now. I really love going to this yoga class. 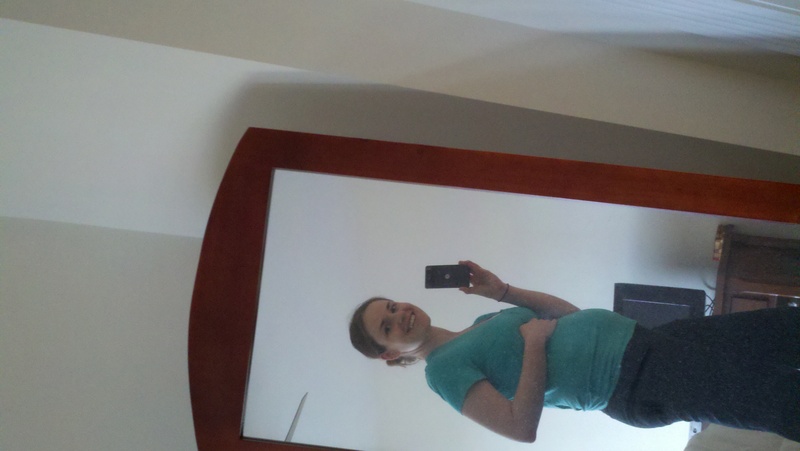 Its nice to focus on my body for a full hour and I really enjoy being around other pregnant women. I get so much attention now that I am pregnant. It can be really overwhelming. I get that ‘everyone loves a pregnant woman’ but I wish I had a penny for every time someone asks me how I am feeling. No one asked me this before I was pregnant! But its like 10 times a day at work, sometimes by people I dont think I have even been introduced to. People are constantly asking questions about names and the nursery and want updates on me and the baby. Sometimes I feel a bit like a walking circus. Thank goodness no one has tried to rub my belly yet! I dont know how Im going to handle that, but my sister warns me – people will come up and touch me without my permission, so I better get used to it. (Arent there laws against this sort of thing?) 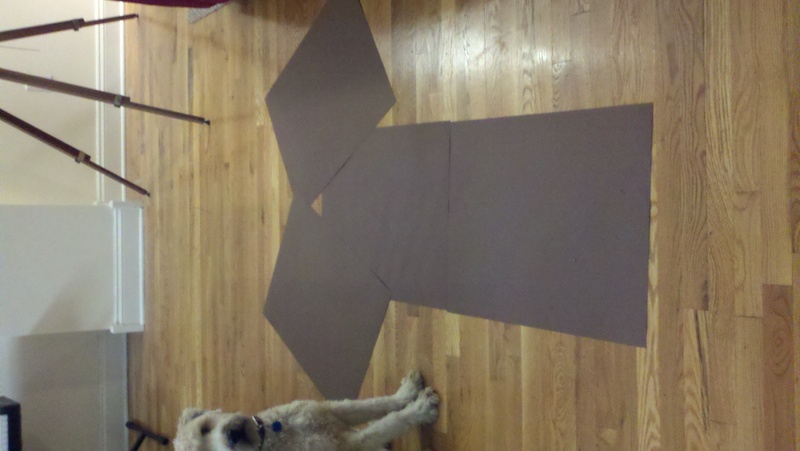 Anyway, the whole point of that rant was to say that this yoga class is the one place I can blend in. I am no one special. Im just another pregnant lady in a sea of pregnant ladies. And, ironically, I feel like its the one place I can focus on my own personal connection with this baby. 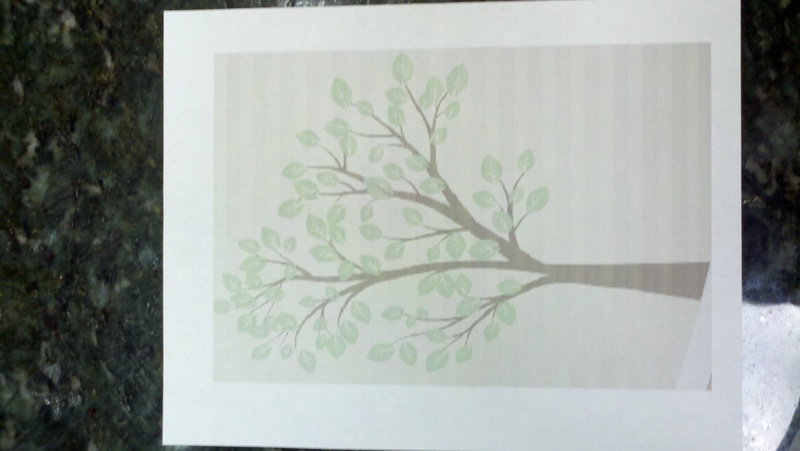 A special thank you to my mom who is my sponsor for this class. I wouldnt be able to afford it every week, but she bought me some passes for my birthday. So I will enjoy going more often 🙂 Thanks Mom! 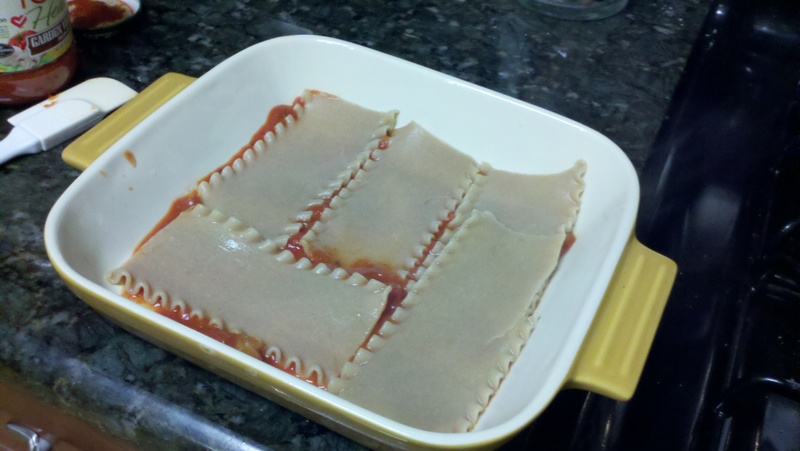 This is not the best lasagna you’ve ever had. If an Italian grandmother came across this post, she would cry. (I sure know how to sell a recipe, don’t I?) However, this IS a very healthful meal and a nice all-in-one dinner. You got your whole grains, yours veggies, and your dairy (protein). 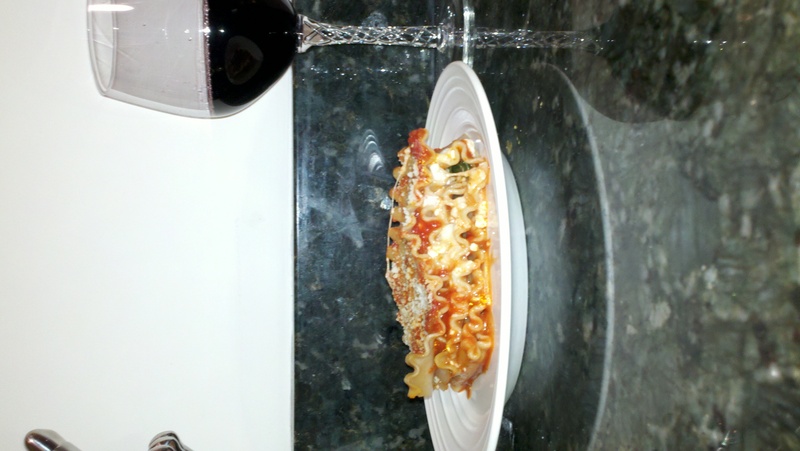 Plus, I feel like lasagna gets a bad rap as being a ‘fussy’ pasta dish, so I hope to show its really not that bad. But if you are looking to impress your boss or mother-in-law, Id go find a recipe with some whole-milk ricotta and sausage, because this is just my ‘every day’ lasagna. I had fresh spinach, mushrooms, garlic, onion, bottle of tomato-based sauce, whole wheat noodles, cottage cheese, and mozzarella cheese. The only thing missing from this picture is a pinch of red pepper flake. 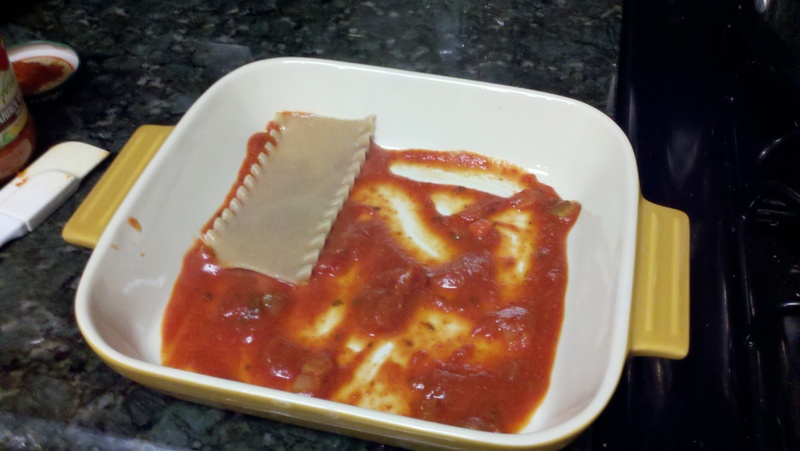 I also really like green pepper in my vegetarian lasagna, but I was out. 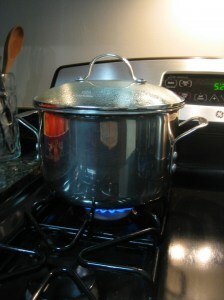 Begin by bringing a large pot of water to boil. And preheat your oven to 350 degrees. 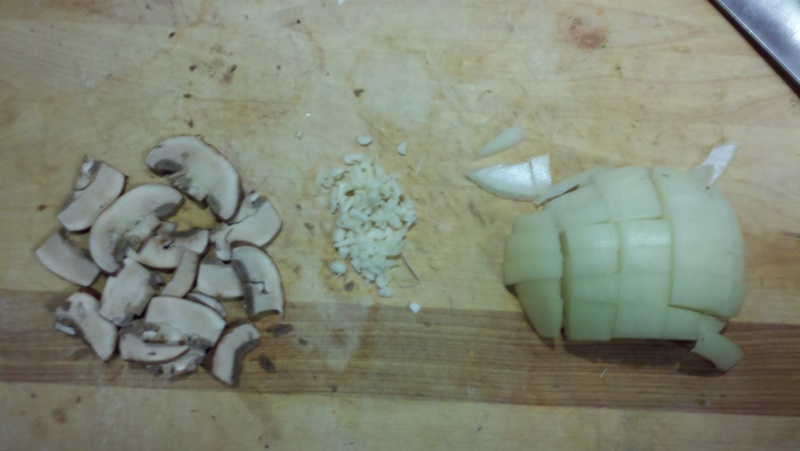 I started with half a large onion (~.75 cups) and 3 mushrooms ( ~.25 cups ) This was a comically small amount of mushrooms, I usually add more like .5 to .75 cups, but I only had a few left in the fridge. Anyway, let those guys saute together for 5-6 minutes until nice and soft. I added a little salt and pepper about half way to help them along. 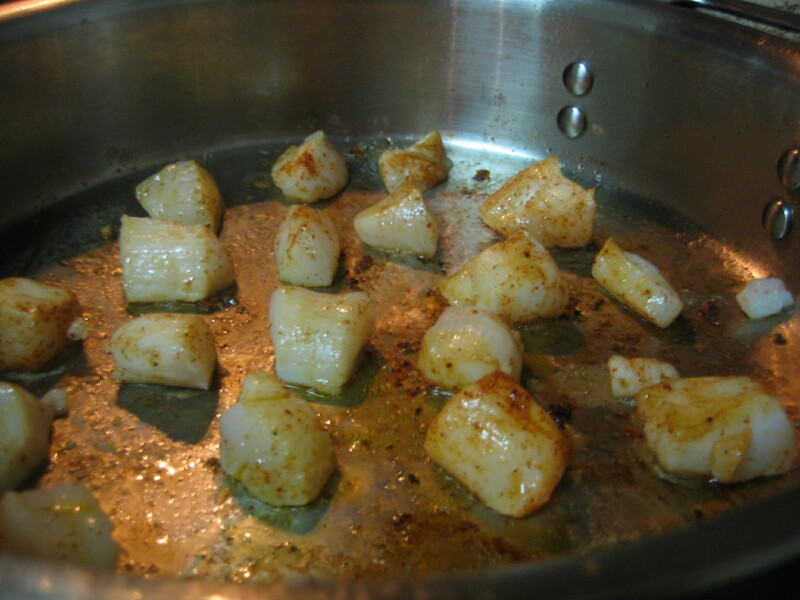 In the last minute, add the 3 minced garlic cloves (~2 tablespoons) and a pinch (~1/8 tsp) of red pepper flake. 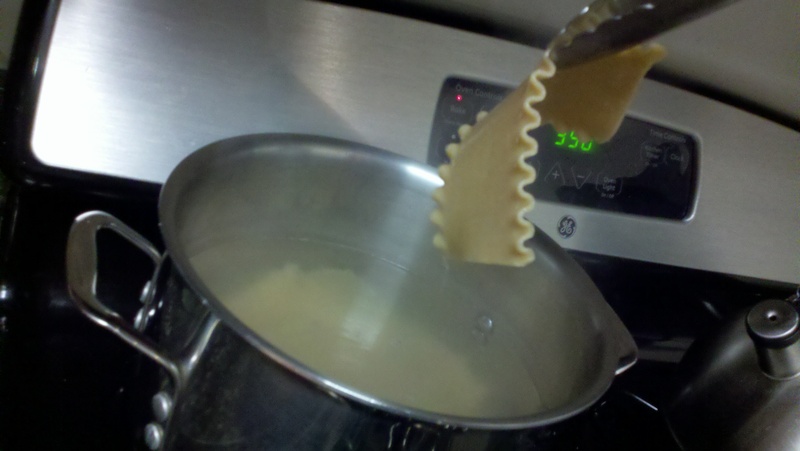 By this time your water should be about ready, so lets add the pasta. Now, maybe someone can enlighten me, is there a ‘lasagna pan’? Seriously. A pan made for the exact size of lasagna noodles? Because I feel like in all the cooking shows, the pasta seems to fit in perfect lines and layers every time. But I have normal sized pans – 13×9, 9×9, 8×8. And my lasagna noodles do not fit nicely into these pans. So this is what I do. 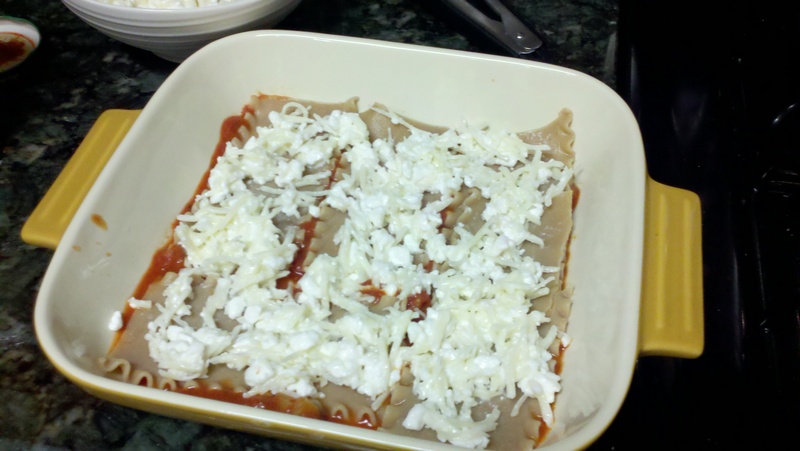 Since this is a smaller recipe for lasagna, I use about 9 lasagna noodles in a 9×9 pan. And I go ahead and snap the noodles in half before dropping them in the water. I had tried boiling them in tact, then removing them and cutting off the last few inches to make them fit into my pan in a uniform manner. But I have found that just snapping them prior to boiling and overlapping them tastes equally delicious. So dont worry too much about the length. It will work no matter what. Its barely any! In fact, I sometimes used frozen spinach in this recipe. 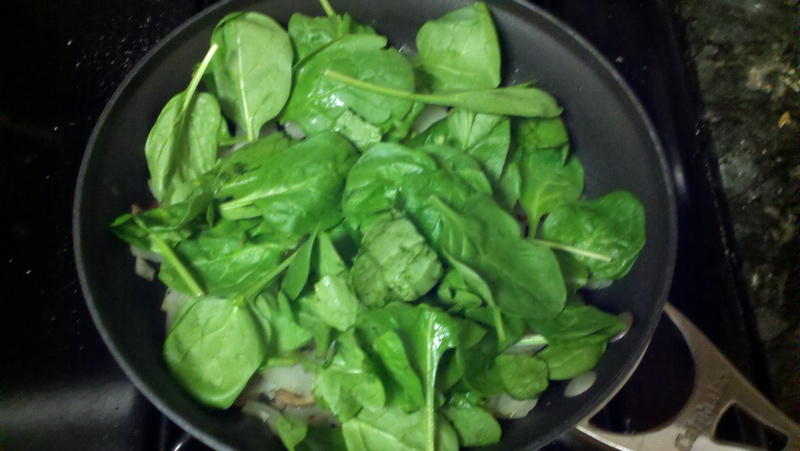 One frozen 10 oz box equals like 12 cups of fresh spinach. So feel free to make it as spinachy as you like. But if you use the frozen spinach just make sure you defrost it in the microwave and squeeze out all the extra water before adding it at this step. 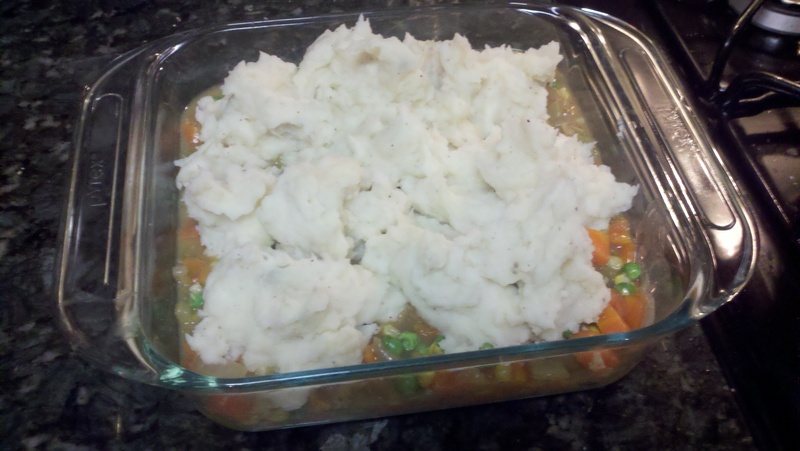 Your veggies are basically ready at this point, you can set them aside til you are ready to layer. As you saw earlier, I am using cottage cheese and mozzarella in this recipe, in contrast to a more traditional ricotta. There are some lower fat ricottas, but Im really not a fan. So in order to keep this leaner, I opt for different cheeses all together. I use 1 cup of low fat cottage cheese and 1 cup low fat shredded mozzarella. I use about .25 cups of sauce on the bottom initially, then your pasta, then half of the cheese, half of the veggies, and about .75 cups of sauce. Then you start over with your noodles again. 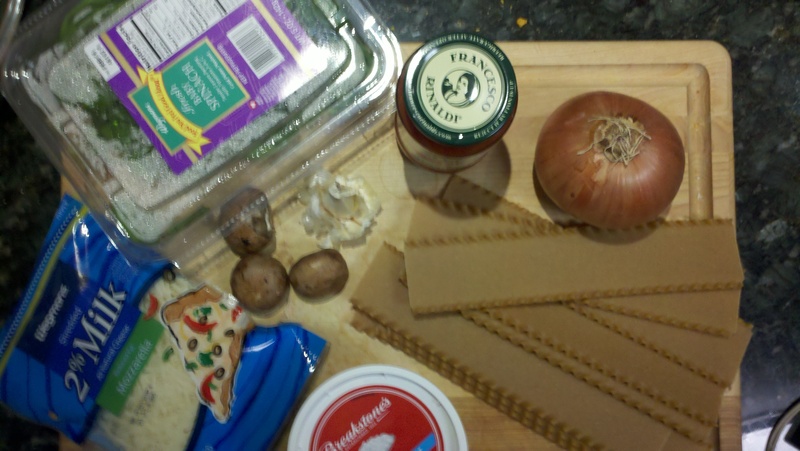 Notice though, that with the next layer of pasta I layered it in a perpendicular fashion to the first layer. 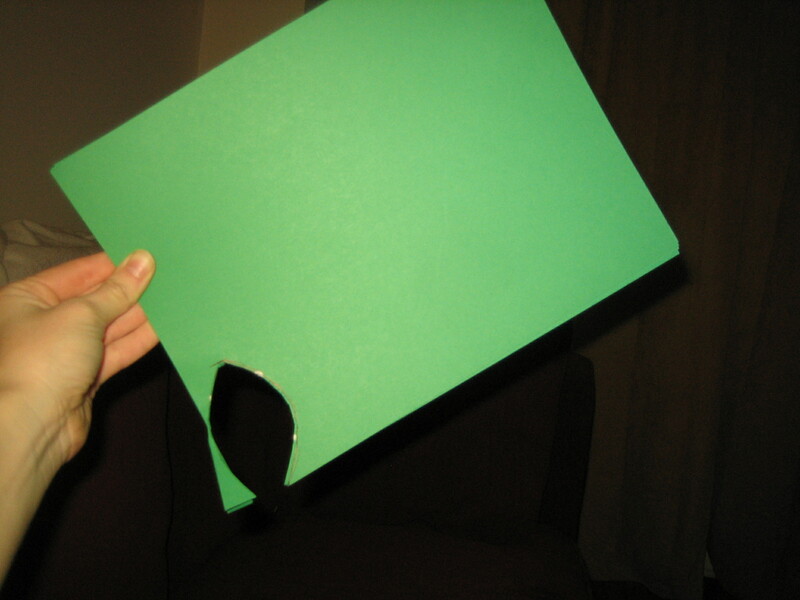 This helps you cut the lasagna out when you are done. If all the layers are facing the same way it can slip and slide all over the place. I only have 3 layers of pasta in this recipe (2 layers of veggie/cheese). 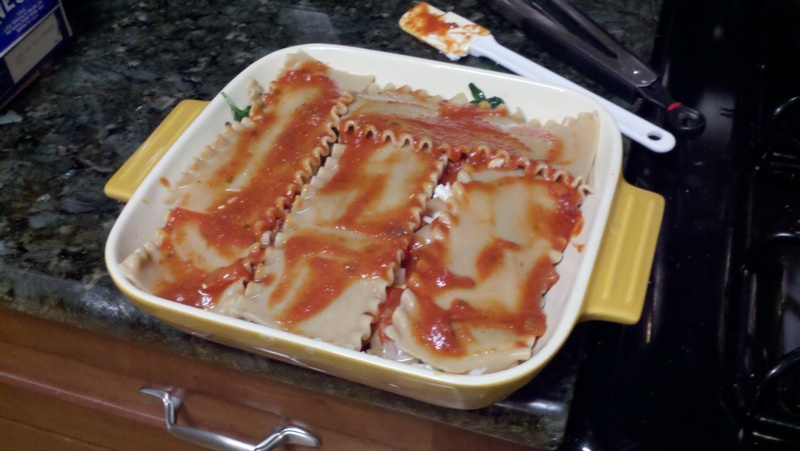 Add another .25 cups of sauce on top of your last layer of pasta to help keep it moist in the oven. 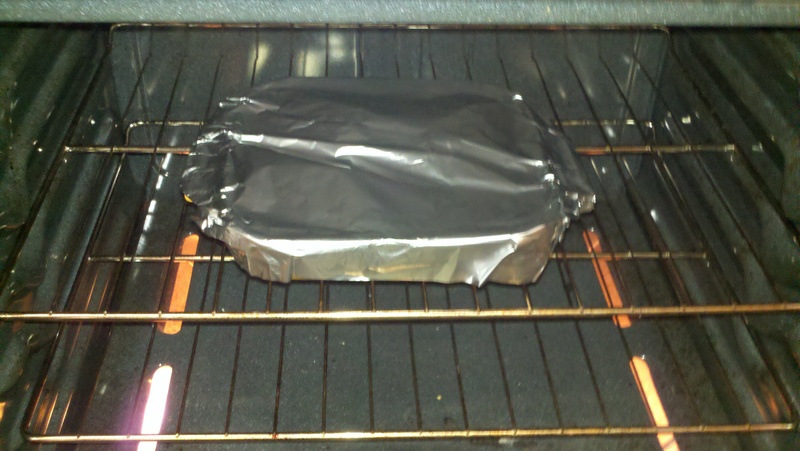 Cover with foil and back at 350 for about 30 minutes. 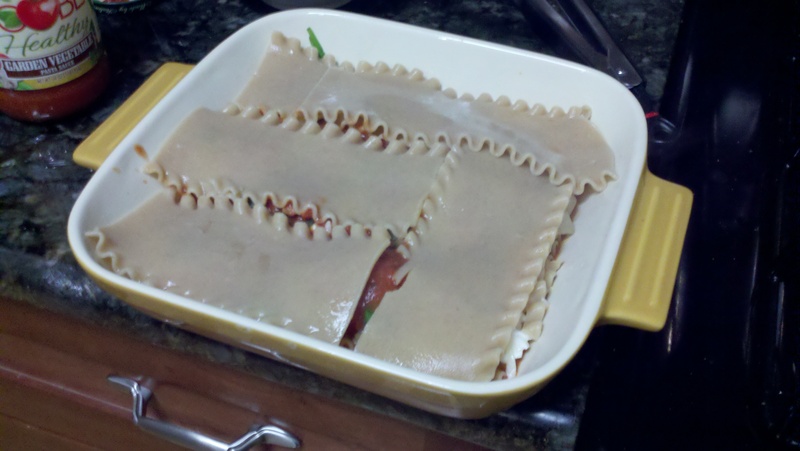 You could also freeze the lasagna, or put it in the fridge for the next day if you choose to (prior to baking). If you simply put it in the fridge, you might want to bake at 350 for around 45 mins the next day. If you freeze, you will want to bake for an hour to an hour 20 minutes. Regardless, in the last 15 minutes of cooking you have the option of removing the foil and sprinkling with extra cheese to brown up on top, if you wish. Since this is my attempt at a healthier pasta dish, I usually just sprinkle a bit of parmesan on after its done. Not too shabby, huh? 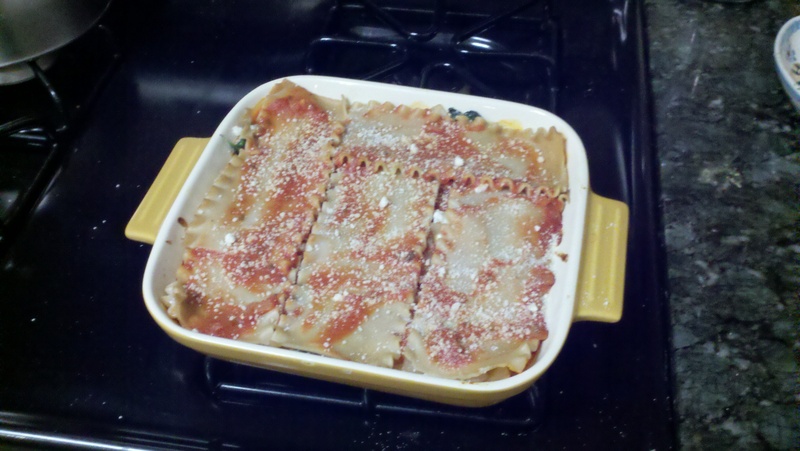 Im no italian grandmother, but this was a darn good thursday night meal. Preheat oven to 350 degrees. 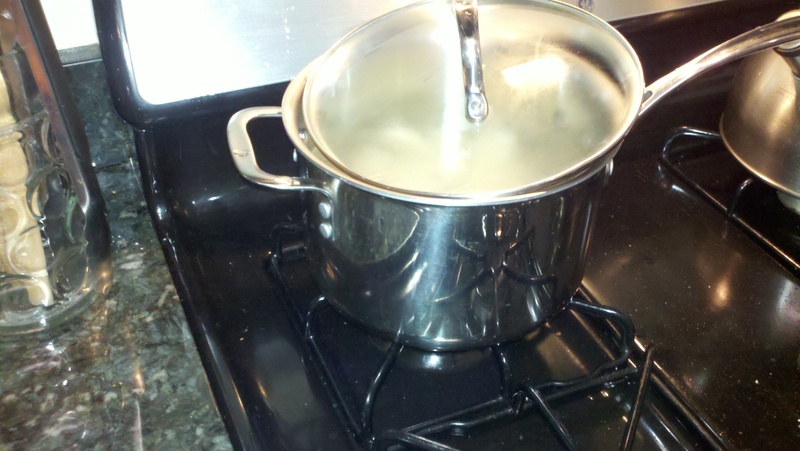 Bring large pot of water to a boil; cook 9 lasagna noodles al dente. 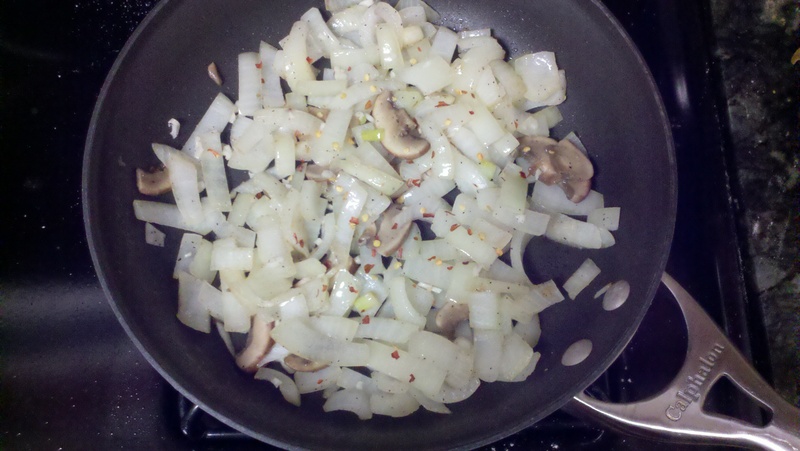 Chop up onion and mushroom, saute for 5-6 minutes until soft. Add minced garlic cloves and red pepper flake, cook for another minute longer. Wilt in 2 cups (or more) of fresh spinach. 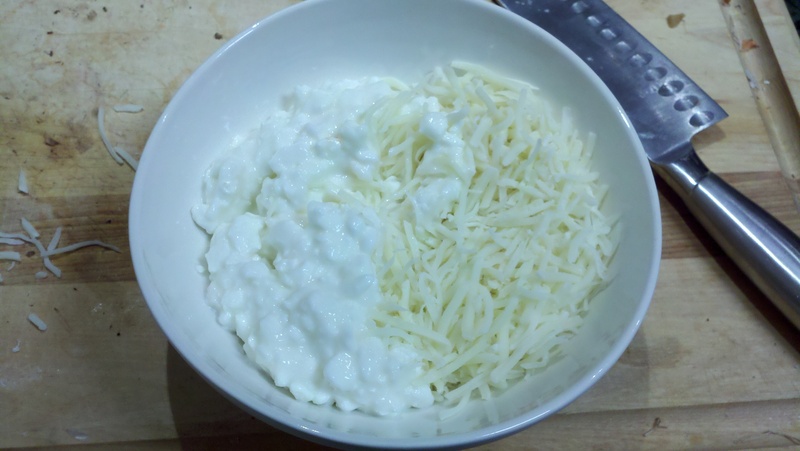 Mix together mozzarella and cottage cheese. 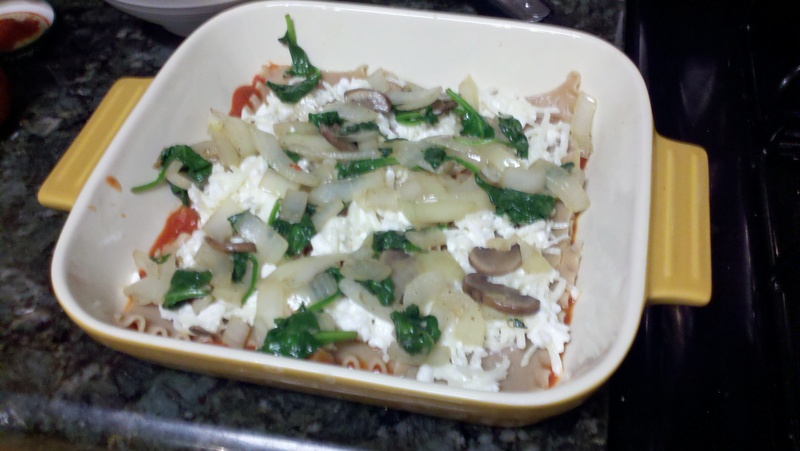 Begin layering lasagna. Add .25 cups of sauce to bottom of 9×9 baking dish, then a layer of pasta, then half of the cheese mixture, then half of the veggie mixture, followed by another .75 cups of sauce. Repeat. This time, place lasagna noodles perpendicular to first layer, then add second half of cheese, last of the veggies, and another .75 cups of sauce. 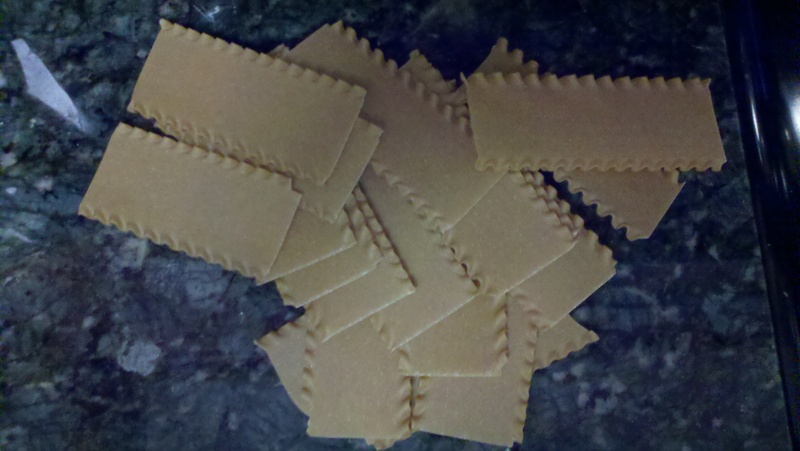 Place last layer of noodles and top with additional .25 cups of sauce. Cover and bake for 30 minutes. 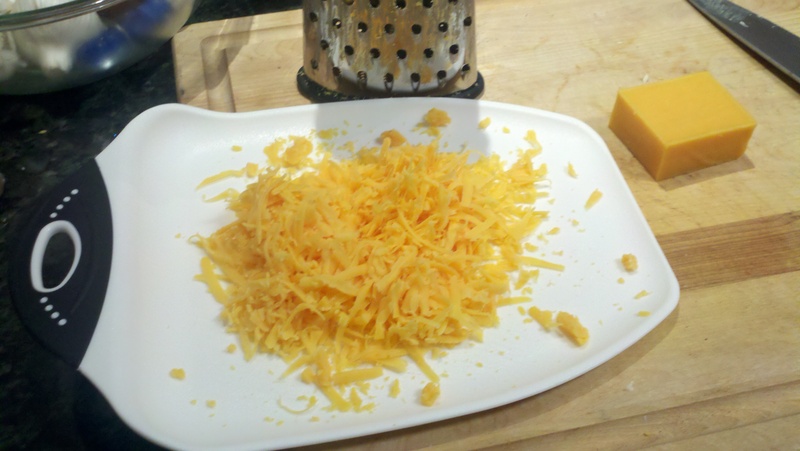 Remove and sprinkle with parmesan cheese.